We arrived in Marrakech by road early in the afternoon, after spending five days and nights up in the Atlas Mountains. 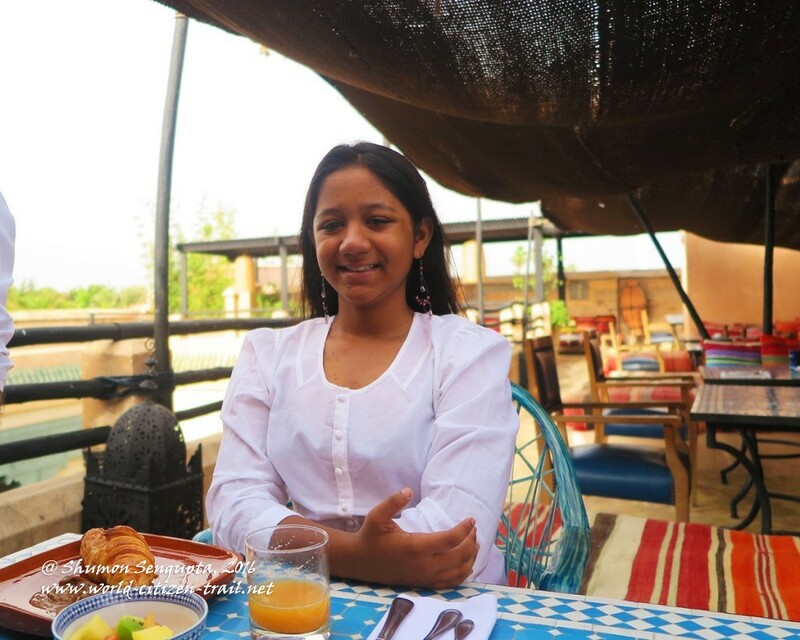 We were in Marrakech for five nights, out of which the last two were at Riad El Fenn. 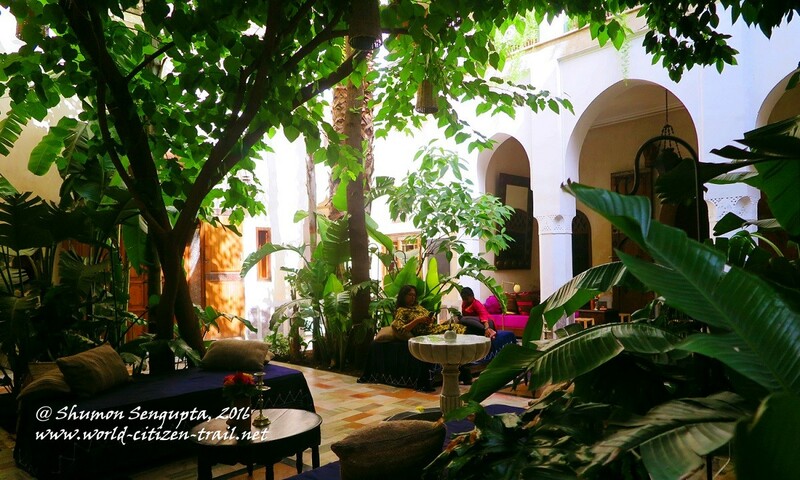 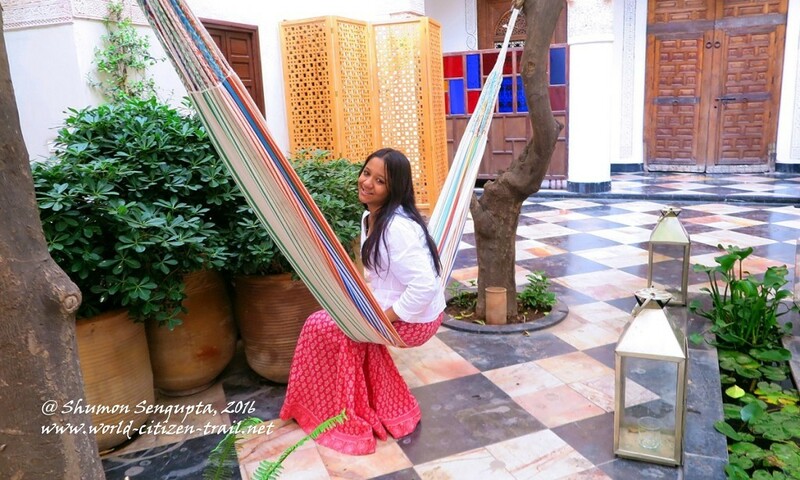 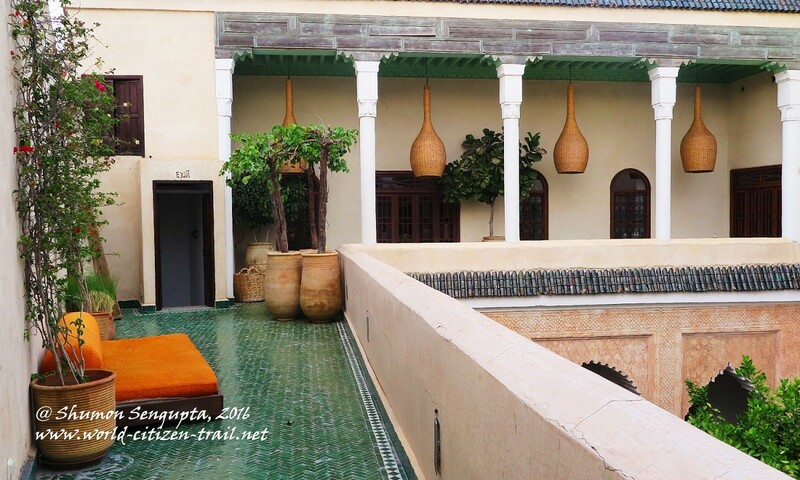 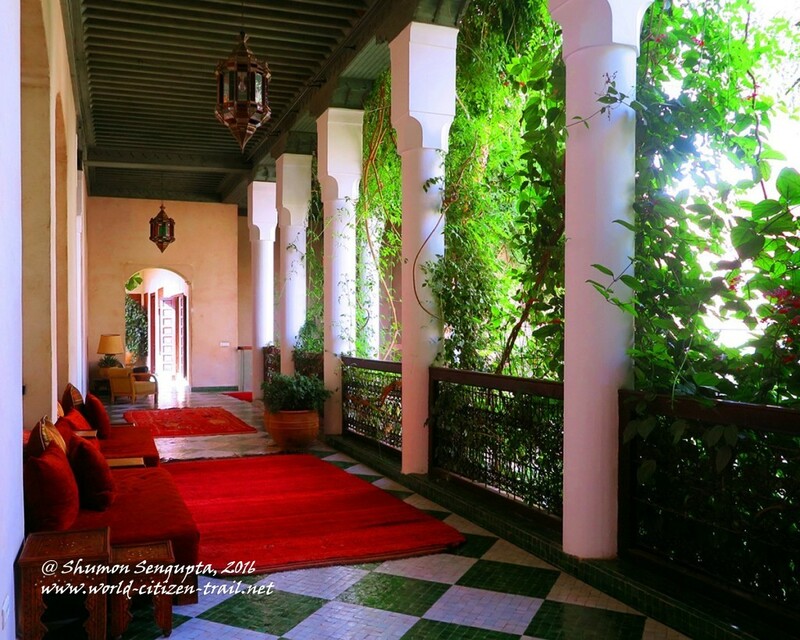 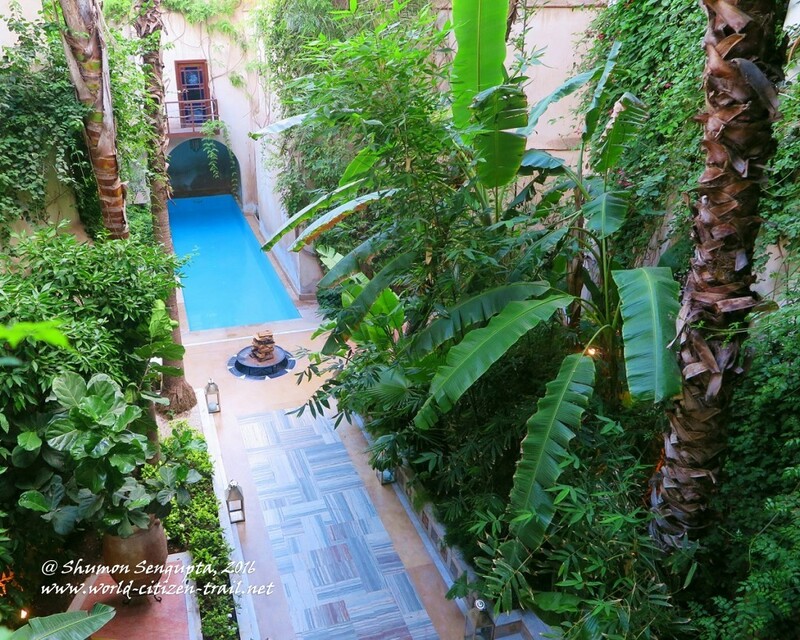 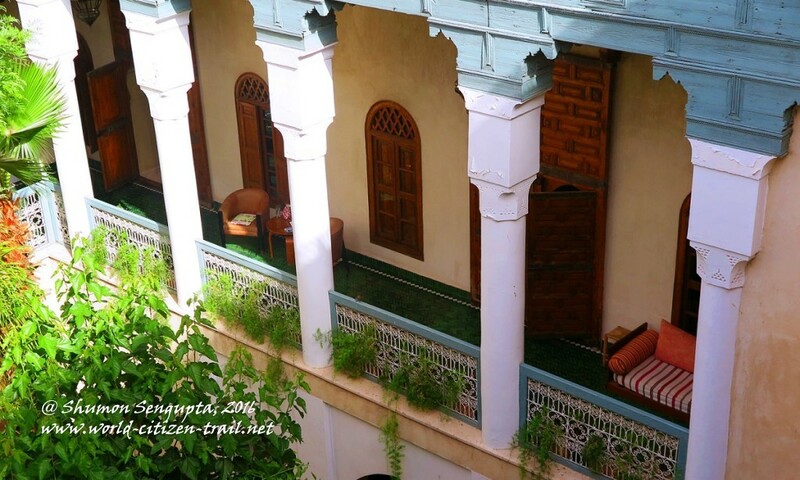 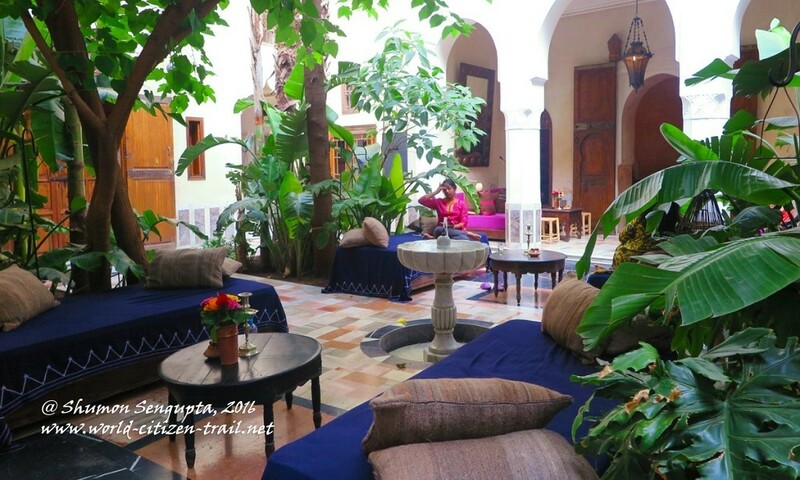 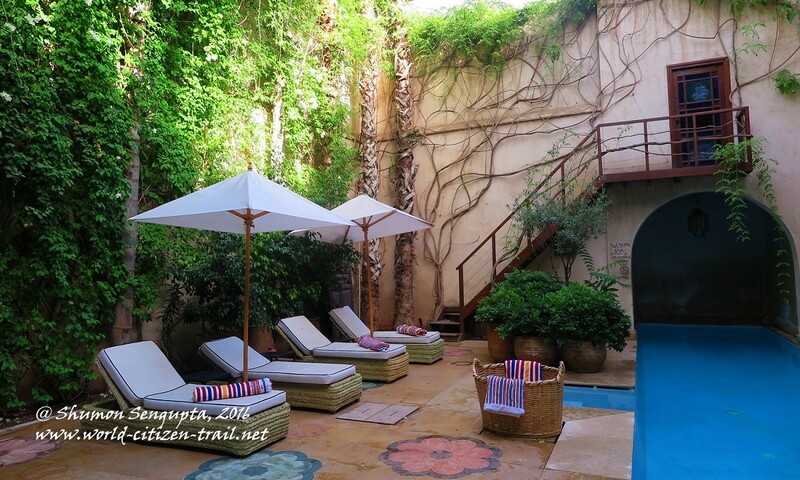 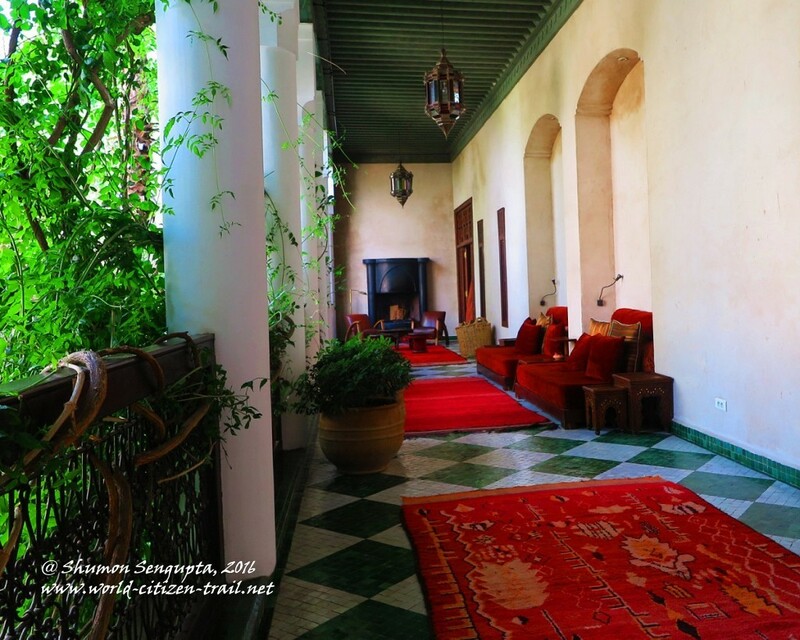 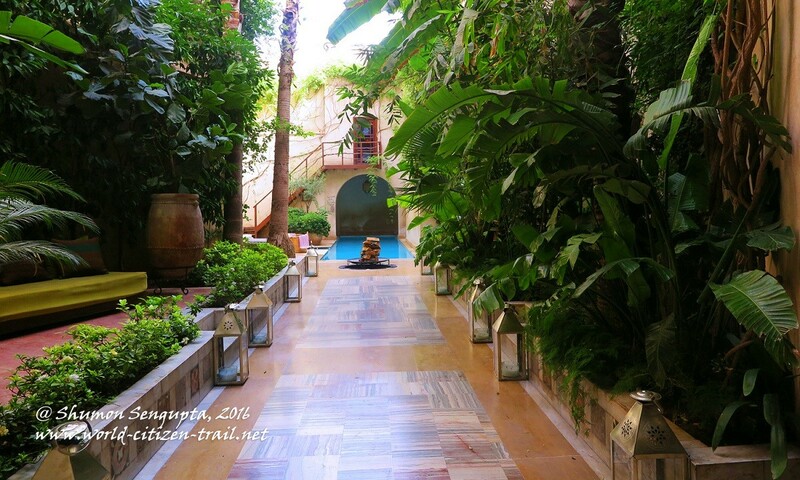 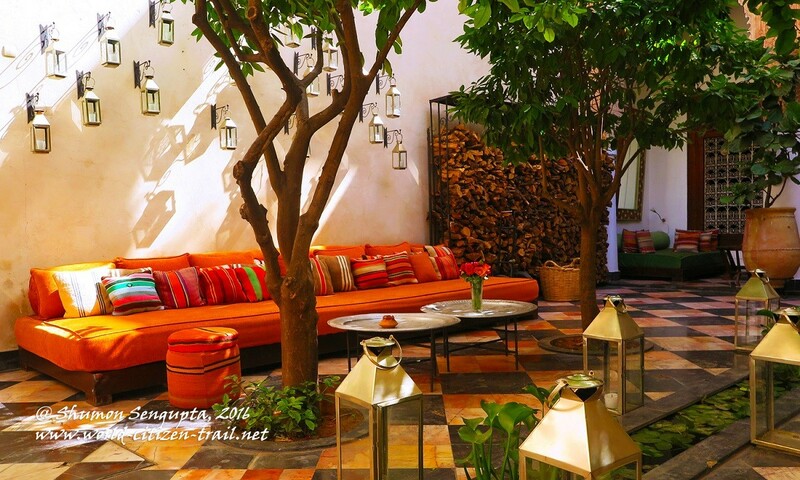 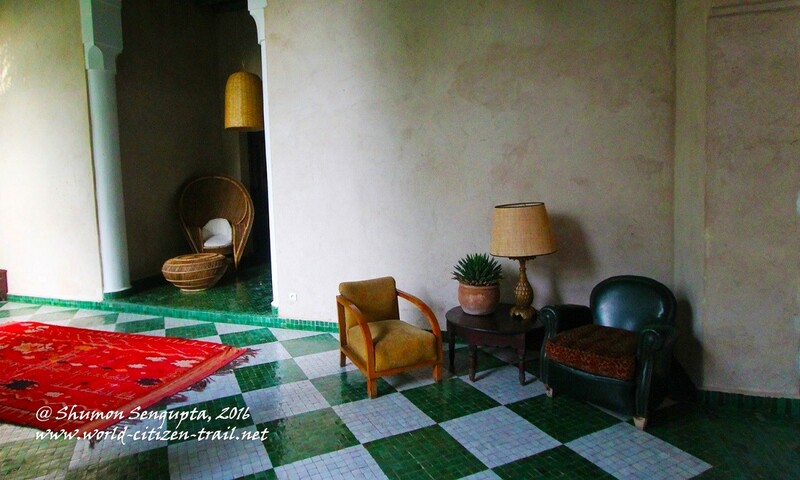 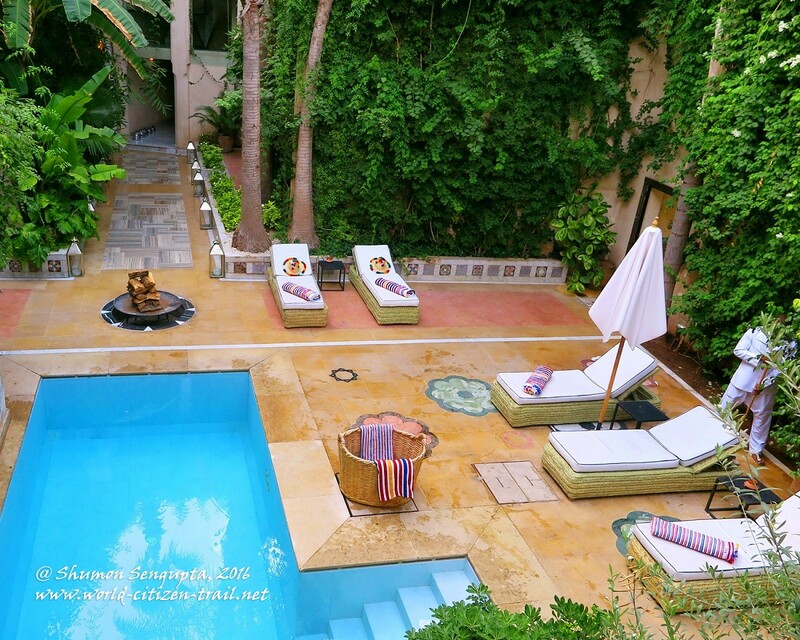 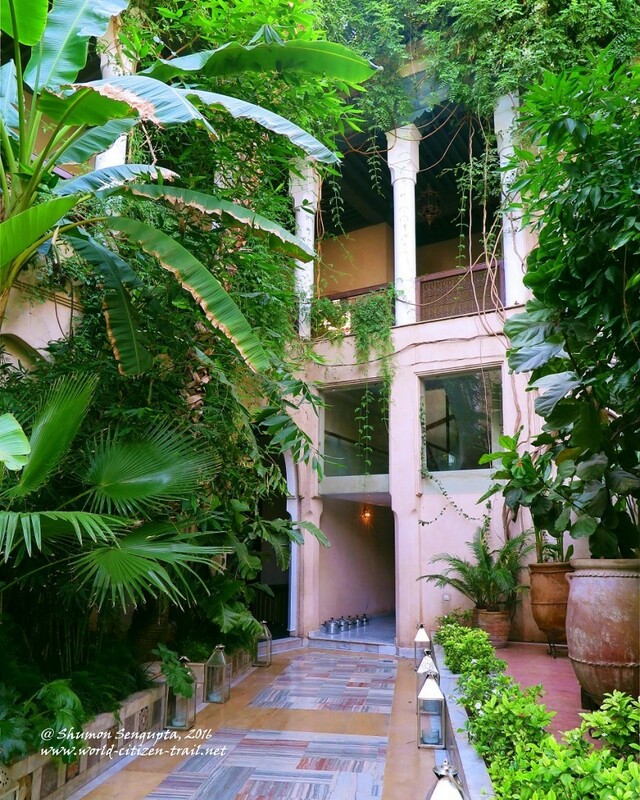 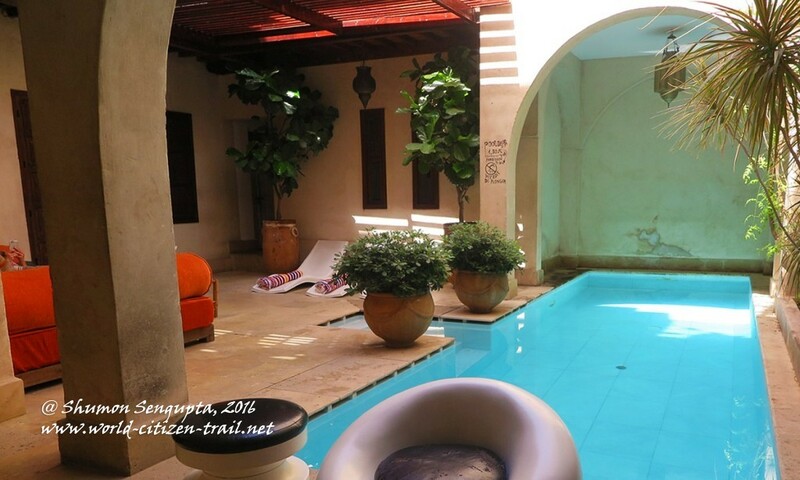 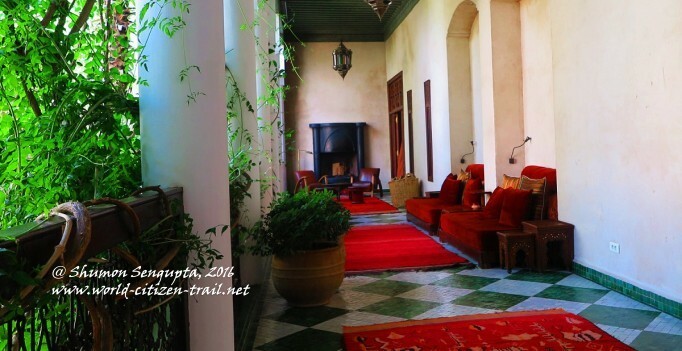 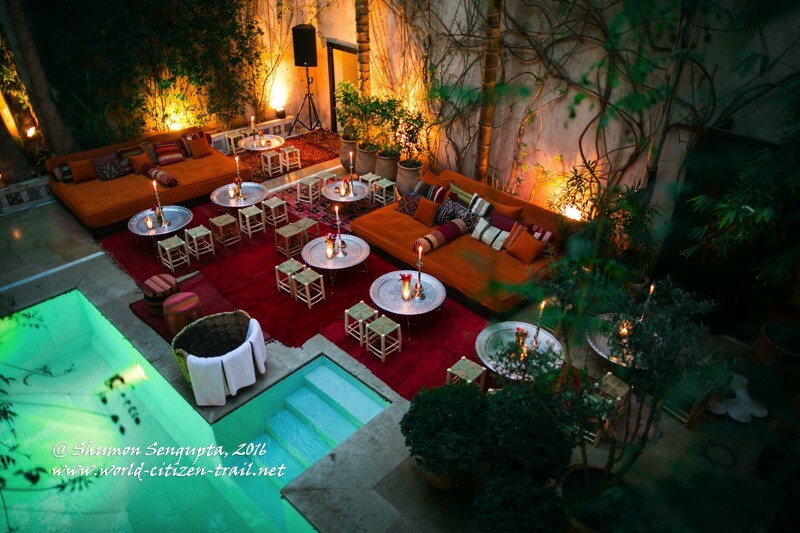 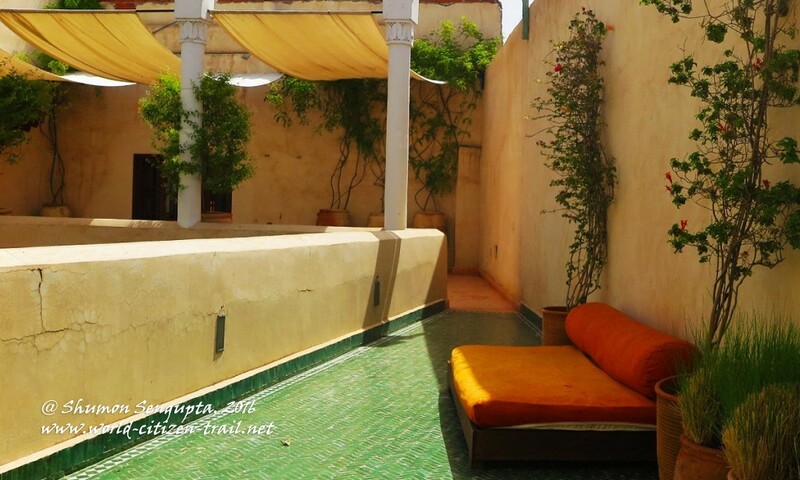 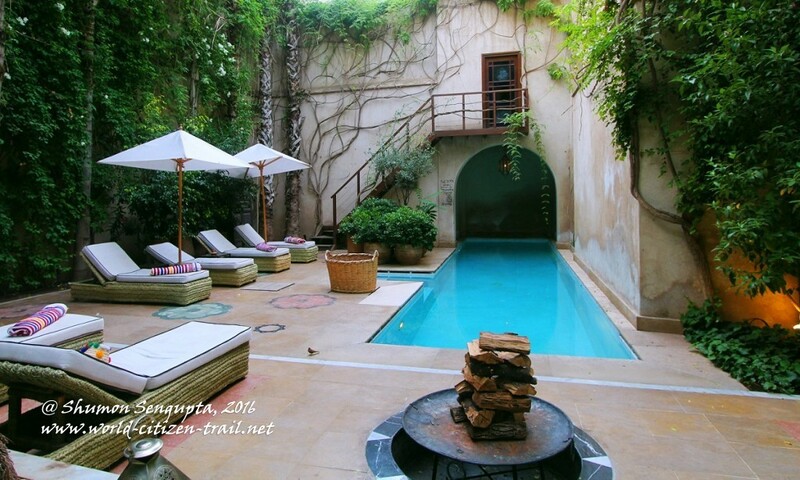 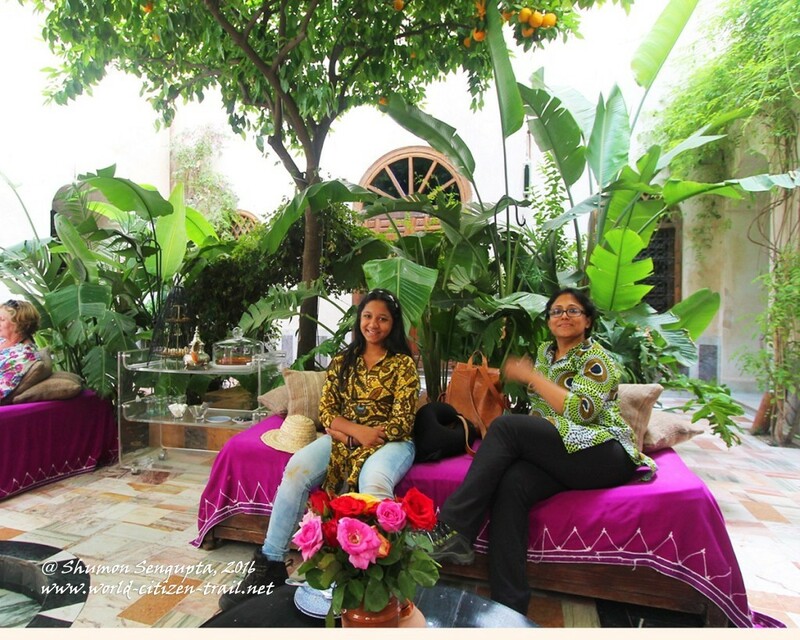 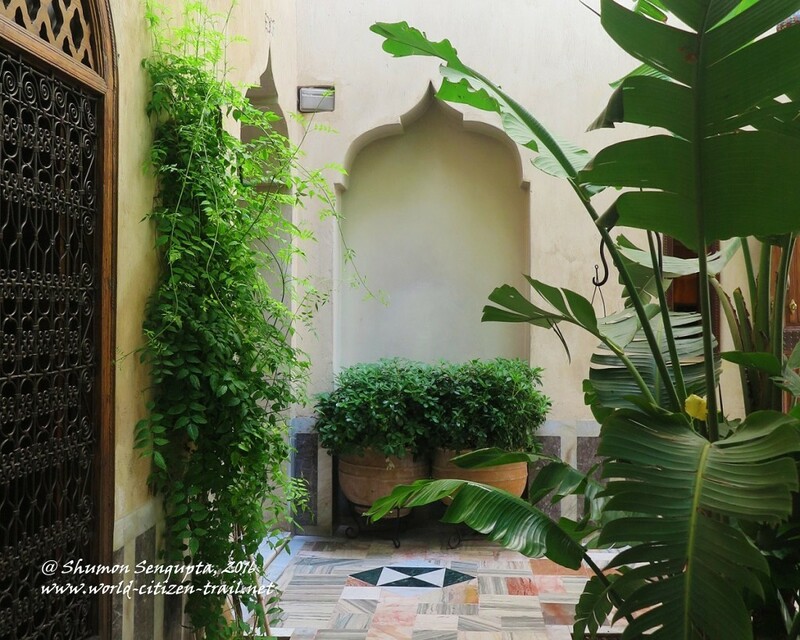 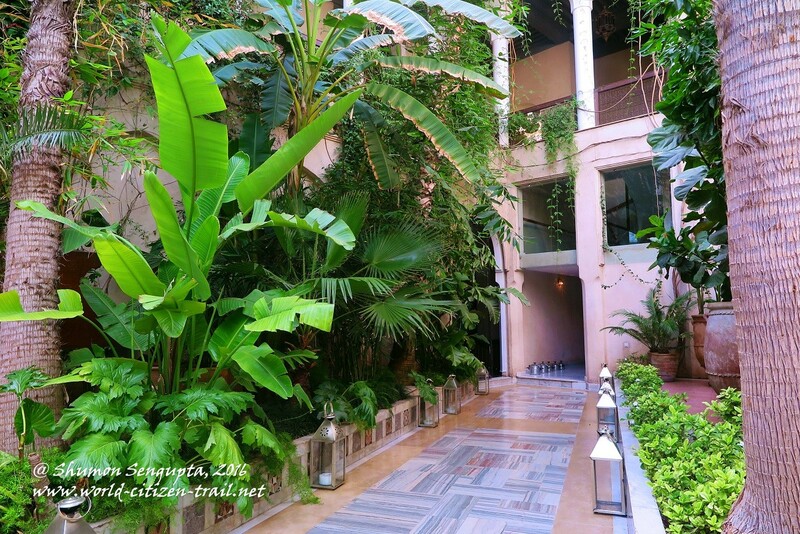 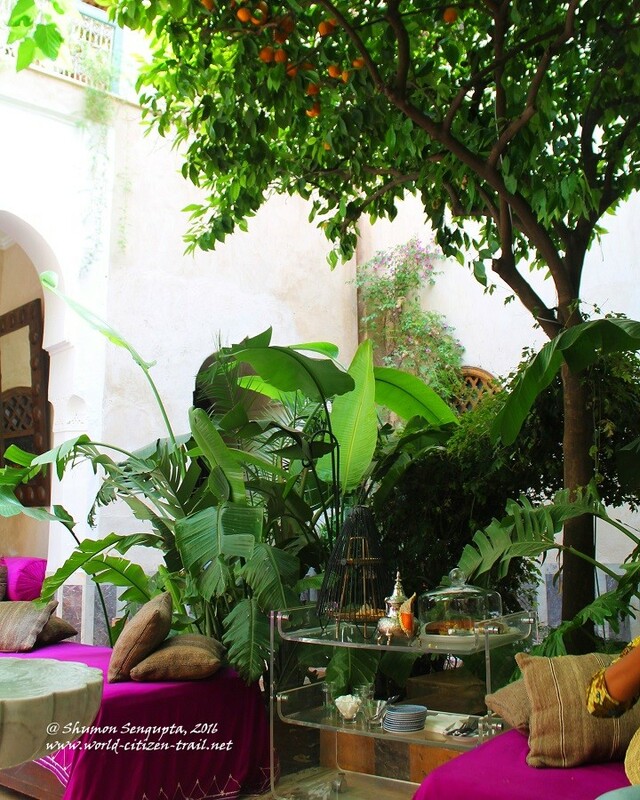 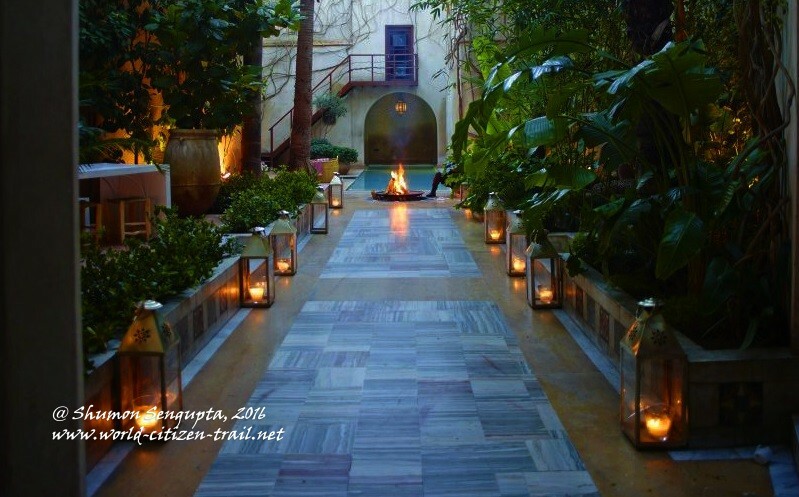 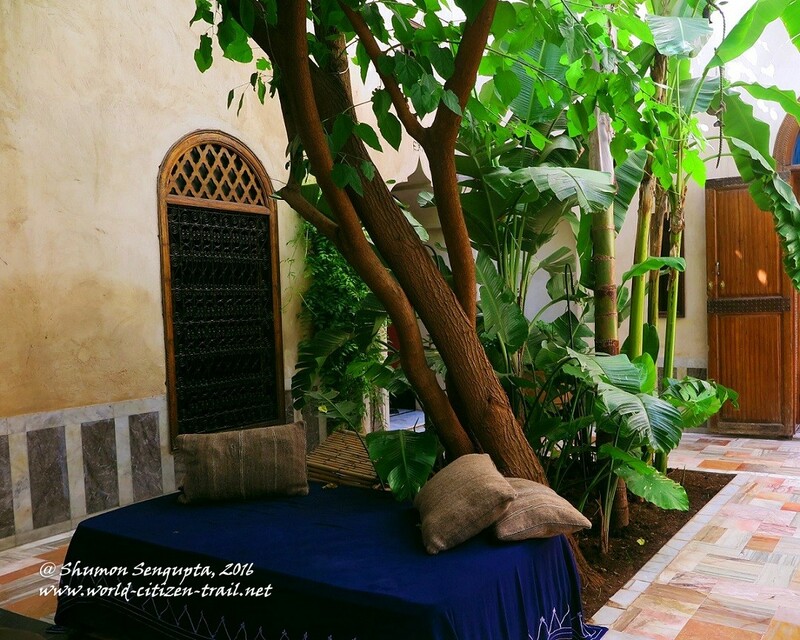 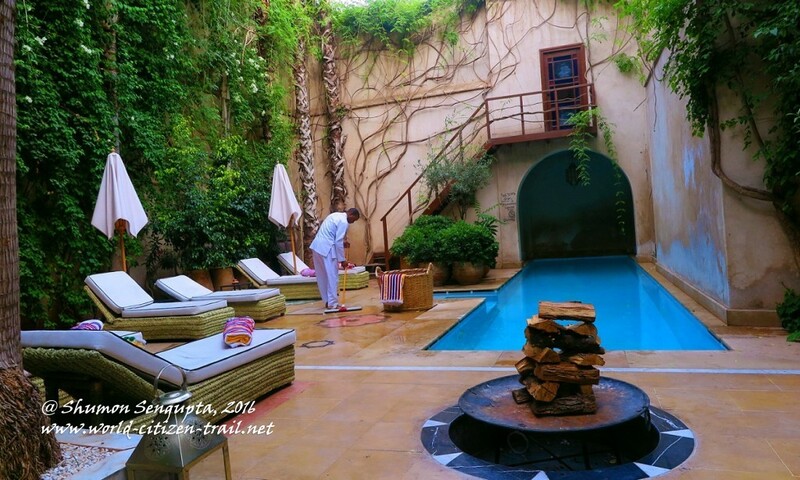 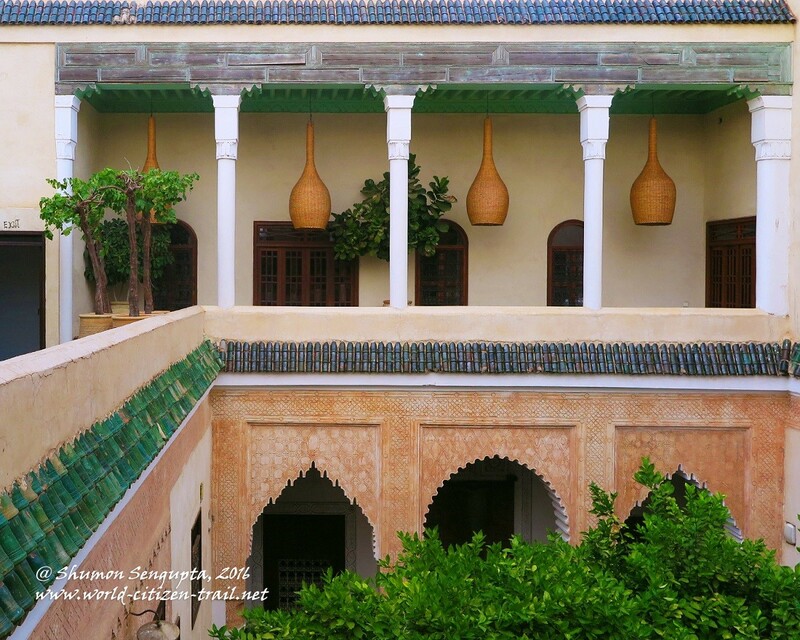 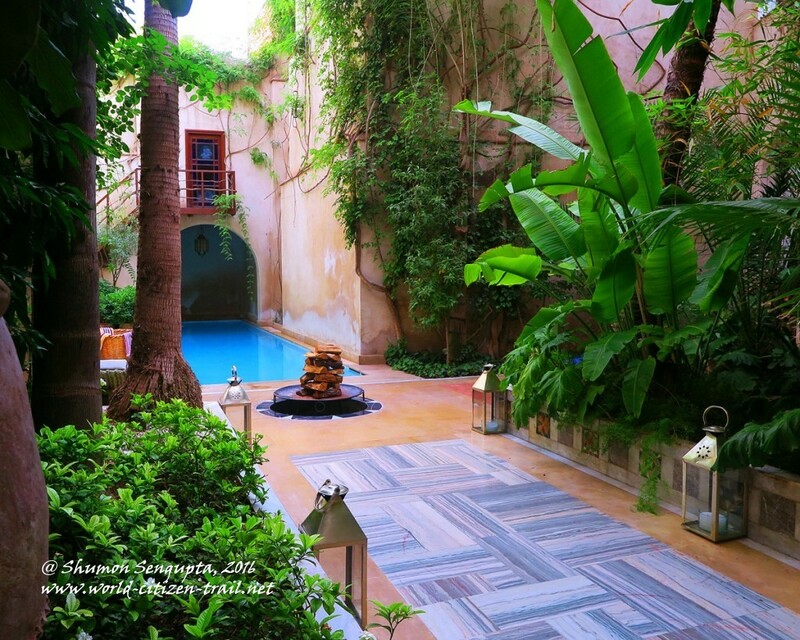 A Riad is a traditional Moroccan townhouse built around a central courtyard. 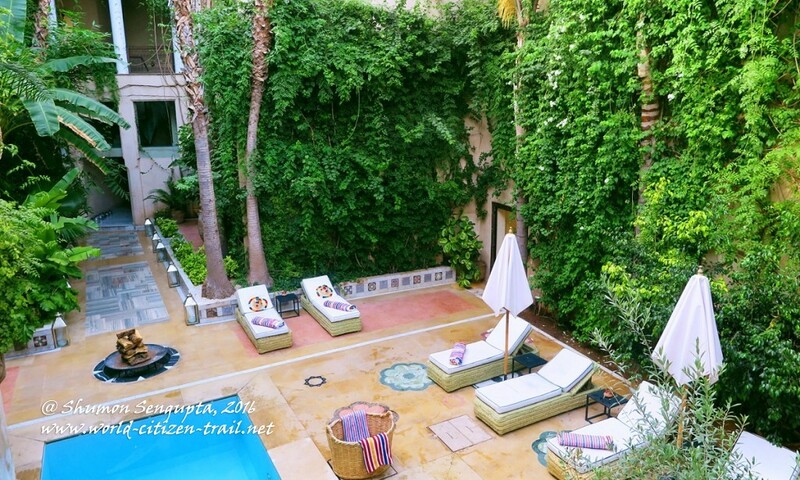 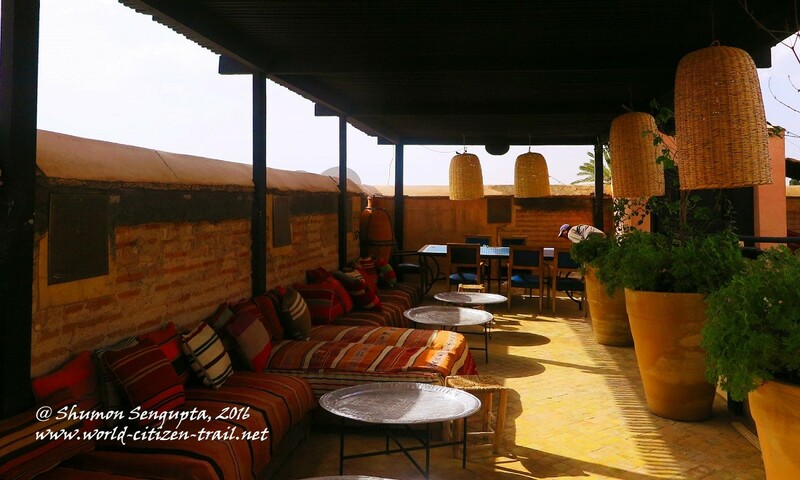 Located in the ancient labyrinthine Medina (fortified old town), El Fenn is a ten minute walk from the iconic UNESCO world heritage square of Djemaa El Fna and the legendary Koutoubia Mosque. Our driver dropped us off in the Medina, from where we walked while our luggage was carried by a porter in a hand pulled cart. Finding our way through the maze of narrow lanes and alleys, we eventually arrived in front of a nondescript, large black door under an arched entrance. 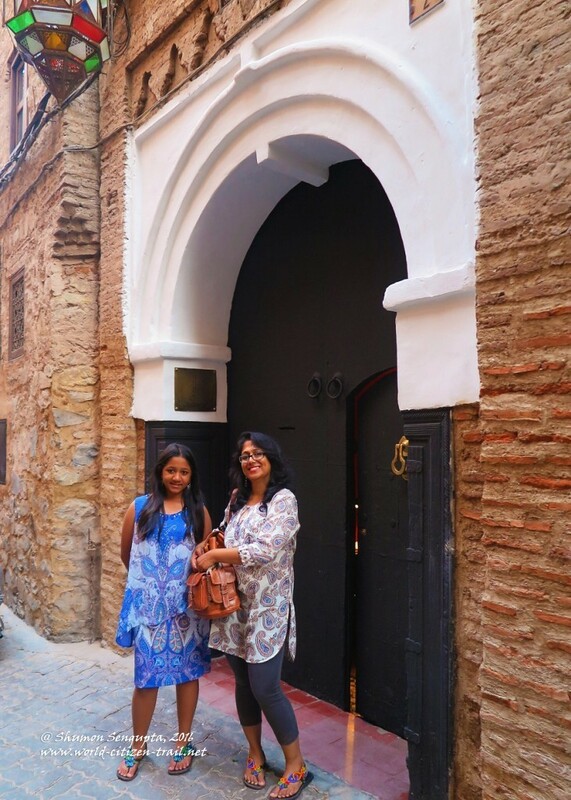 There was an innocuous brass signboard with El Fenn engraved on it. 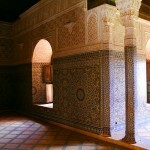 Traditional Moroccan architecture is essentially ‘inward looking’. 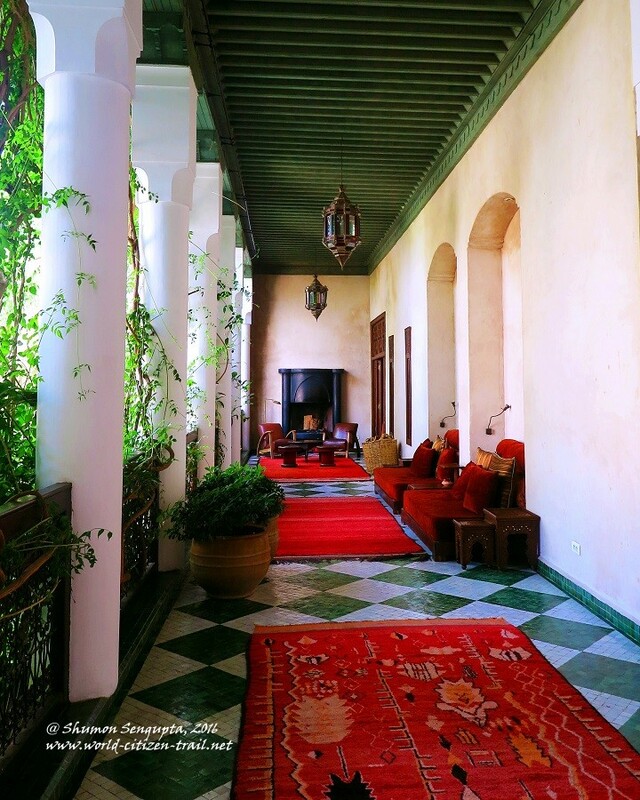 Hence old, aristocratic townhouses of Marrakech (the Riads) shun ostentatious facades and exterior decorations in favor of elaborately embellishing their enclosed private interiors with complex and vibrant mosaics, intricate stucco (‘arabesque’) and delicately carved woodwork. 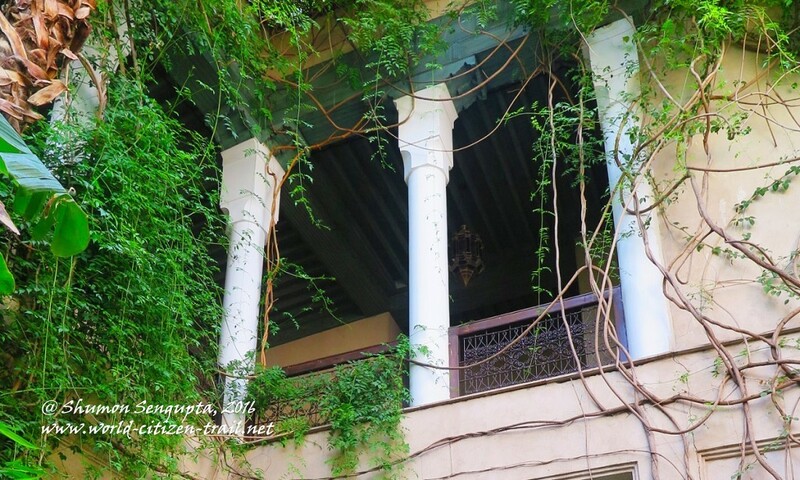 Hence the richness of what lies within these buildings contrasts dramatically with the deceptive plainness of its external appearance, and the lack of a frontage. As a standard pattern, rooms in a Riad are organized around a quadrangular central courtyard. This courtyard, which opens up to the sky, generally has a small fountain, shaded trees (often citrus) and ornamental plants. Windows, interconnecting galleries and balconies look inward into the courtyard. 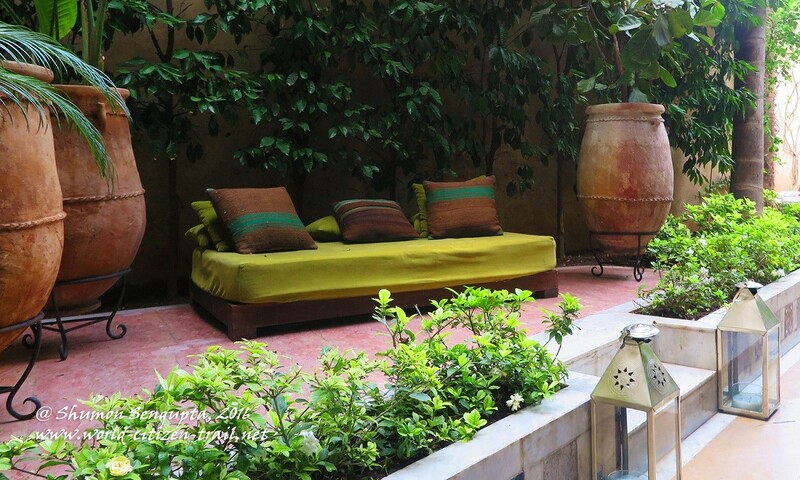 This provides maximum privacy to the residents from the world outside. The modest entrance of El Fenn belied the charm and grandeur that lay within its antiquated walls. 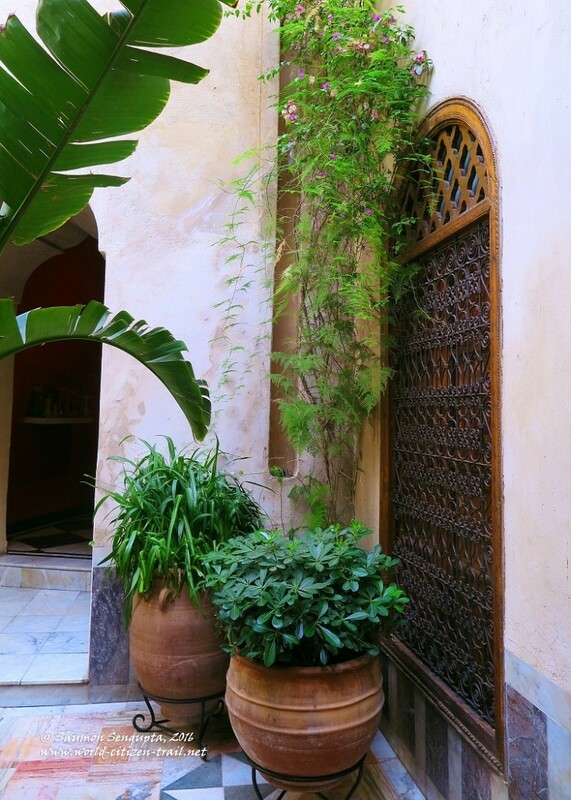 A gentle knock and a uniformed employee opened the heavy black door for us. 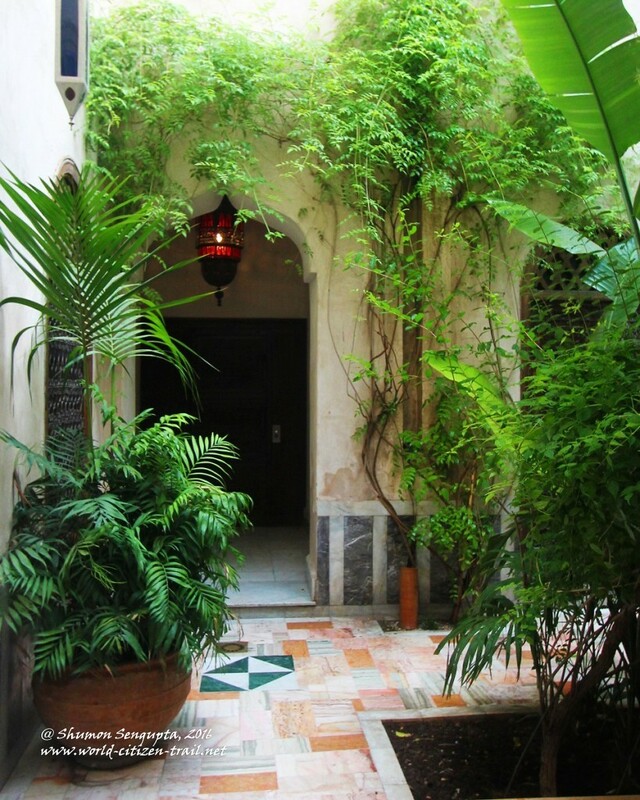 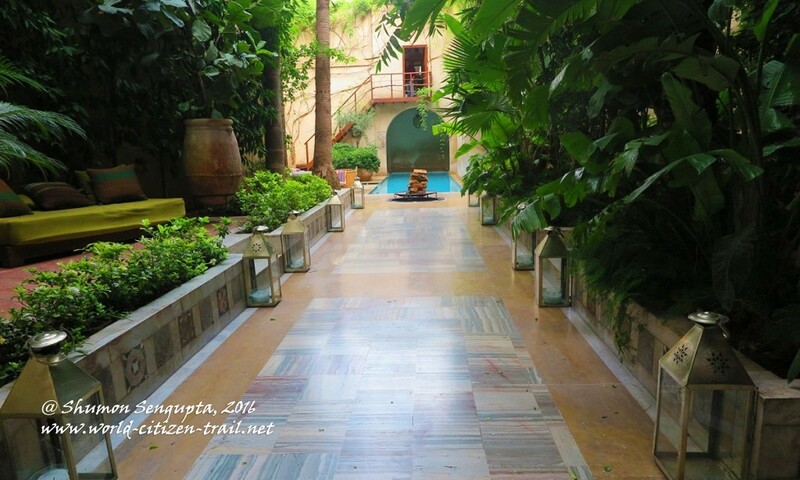 From there we moved along a dark and dimly lit crimson passage, into a bright and serene open-sky courtyard. 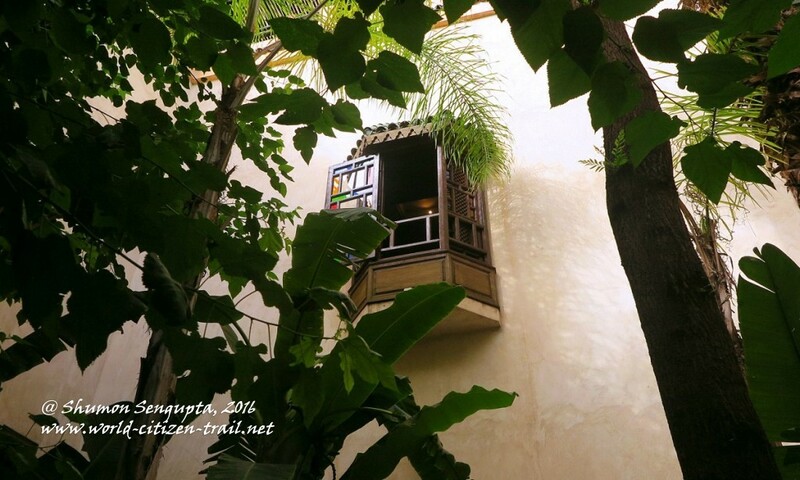 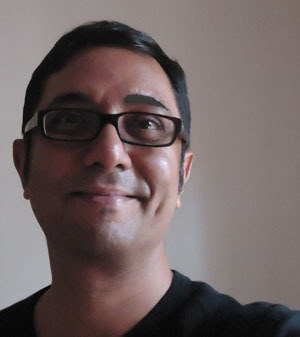 It was a dramatic transition from darkness to light – literal and metaphorical. 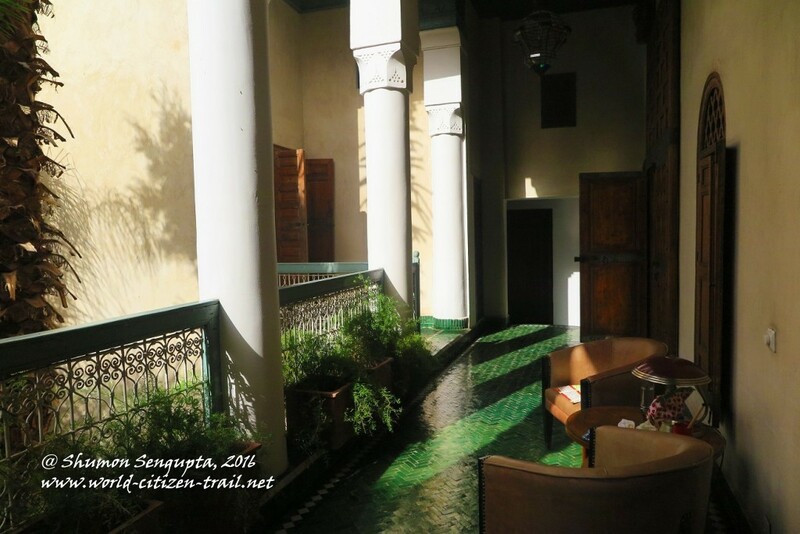 There was no front desk at El Fenn; just a small inconspicuous office next to the library. 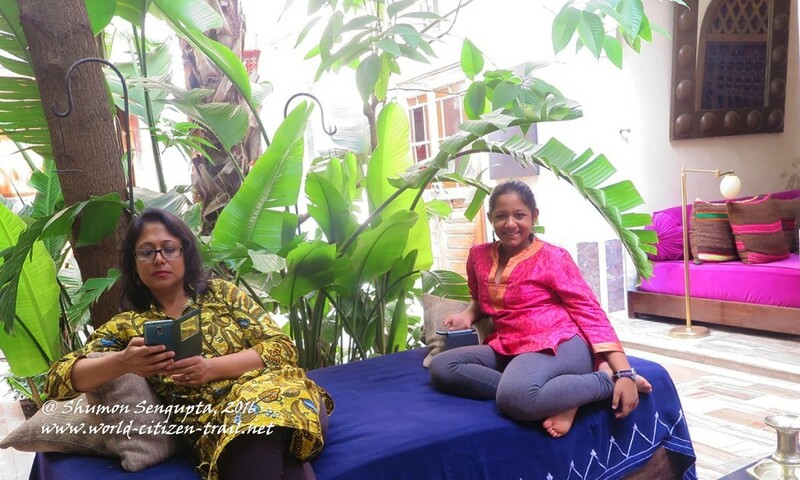 We had a quick and seamless check-in process over a glass of refreshing mint tea, as our luggage were carried off to our room on the third floor. 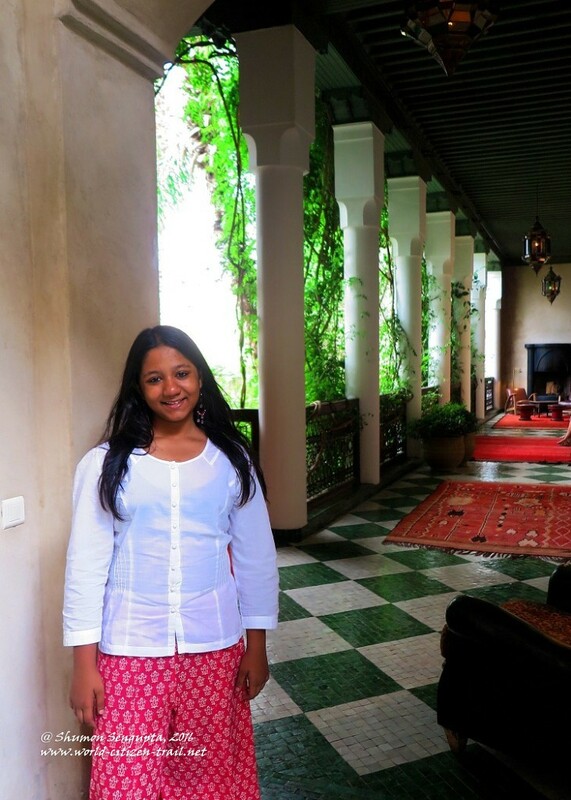 A charming member of staff showed us around the place. 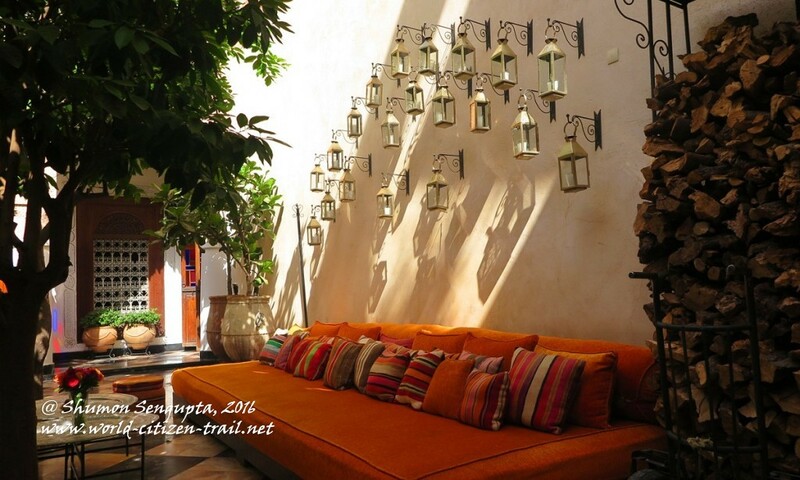 We found glass lanterns, dangling wicker lampshades, vases stuffed with fresh cut roses, and numerous nooks and secluded corners with couches and colorful cushions and bolsters all over the place. 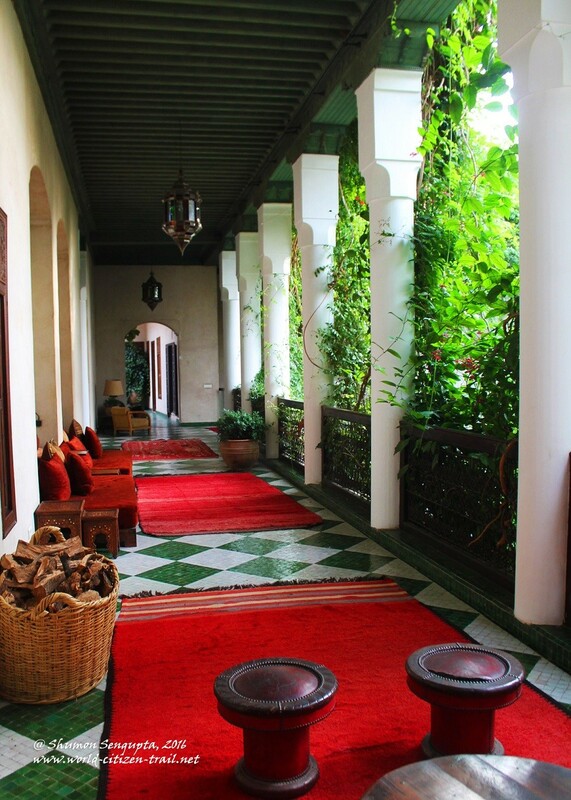 An old world of solid thick walls, checkered flooring, high arched ceilings, brightly painted hallways, hidden alcoves, colonnaded galleries, carved cedar wood arches and traditional stucco work contrasted beautifully with a fascinating collection of contemporary art works placed all over the property. 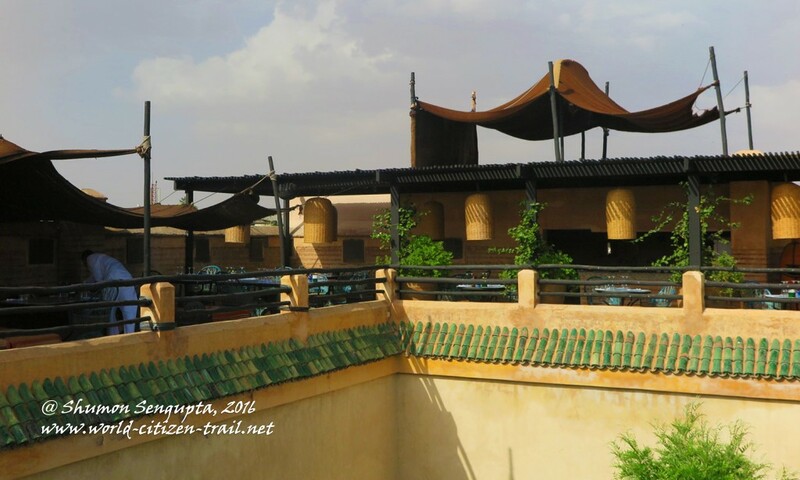 Here, a few words on the history of El Fenn would be in order. 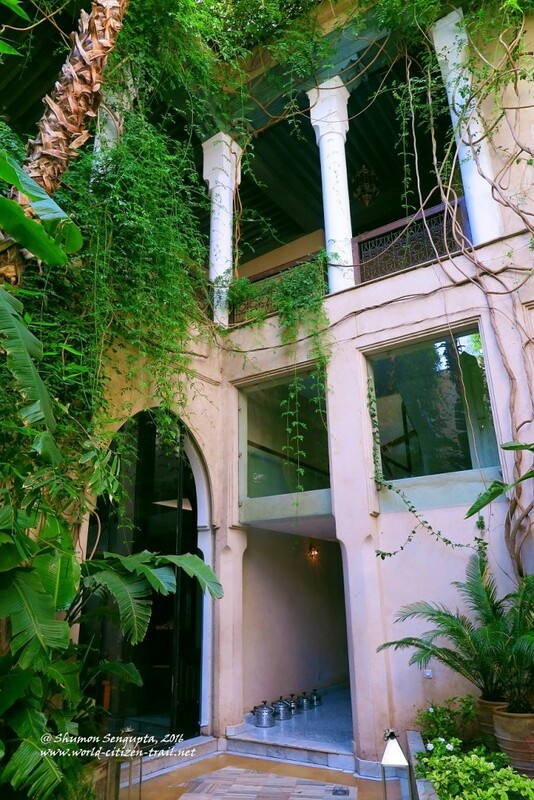 In 2002, Vanessa Branson (a champion of cultural and ecological initiatives, founder of Marrakech Biennale, and incidentally, sister of British business magnate Richard Branson) and her business partner, Howell James, bumped into this old traditional townhouse in Marrakech – a building that was in a state of ruin, but had an inexplicable atmosphere and a magical charm to it. 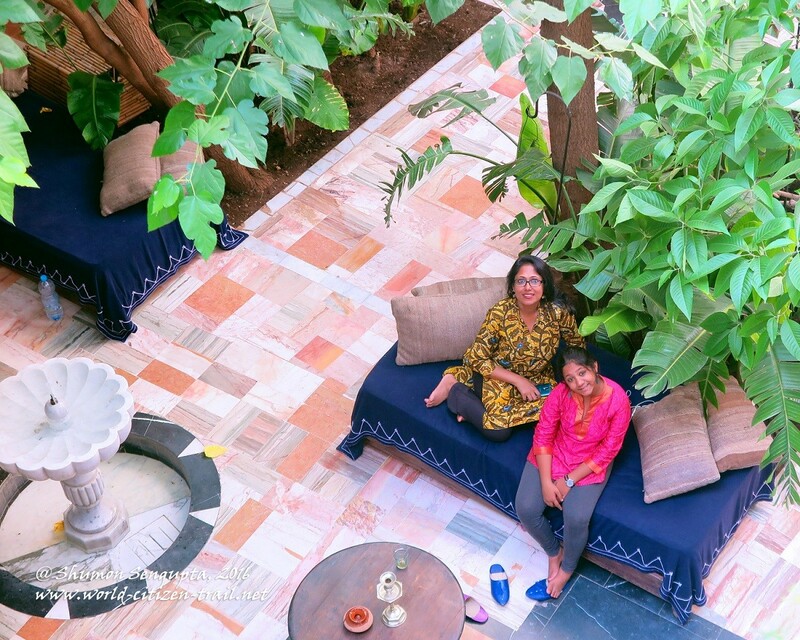 They bought up this century old dilapidated house and embarked on a two year restoration and renovation project that saw local craftsmen use traditional Moroccan building techniques to transform the building into the jewel it is today. 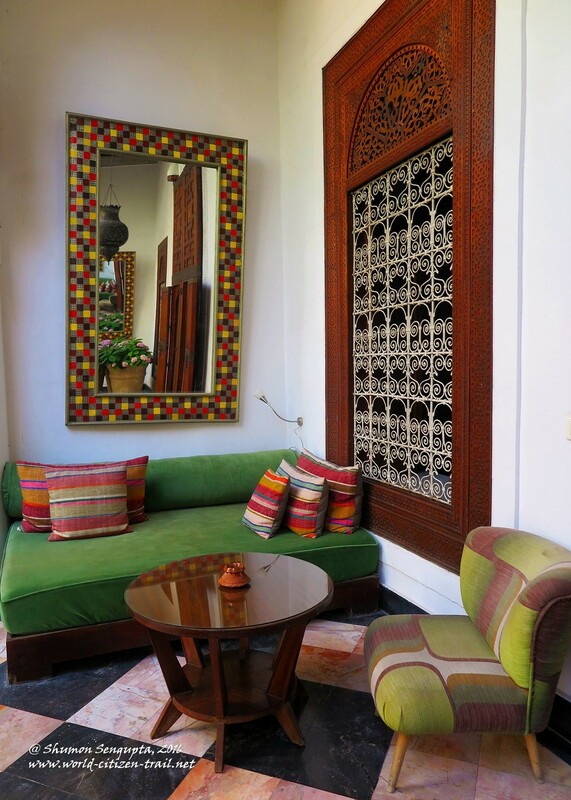 The process included restoration of original carved cedar ceilings and doorways and renovation of the original tiling. 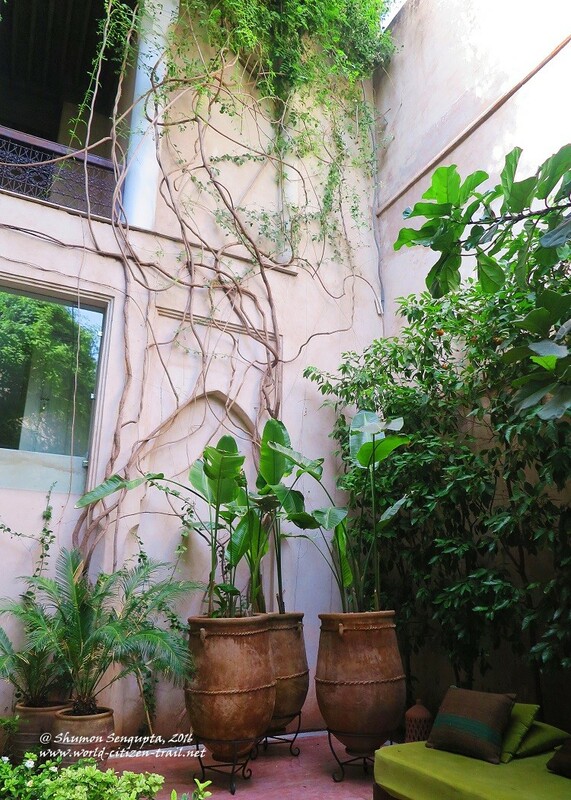 Subsequently, Branson and her associate bought two adjoining townhouses, renovated these and joined the three properties together through an interconnecting set of corridors/passages and courtyard gardens. The complex restoration work was done with the expertise of renowned Moroccan architect, Amine Kabbaj. 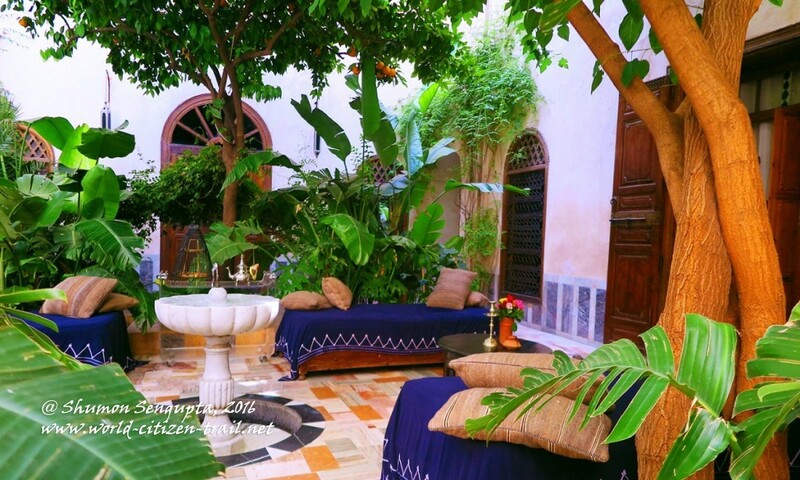 Serene courtyard gardens which open up to the skies are filled with orange and lemon trees, ornamental plants, flowering shrubs, palms, vines and tumbling creepers, hosting colonies of tiny birds that fill the air with their calls. 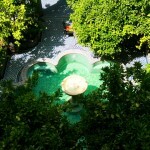 In daytime, you have dappled sunlight filter in through the green canopy, casting shadows that create a hazy dreamlike feel. You can doze off in the hammock under the citrus trees in the courtyard, or read a book lying in one of the many comfortable couches or daybeds, or just do nothing and simply let the world go by. Trays of delicious homemade cakes and cookies are served along with fresh mint tea every afternoon, at 4, in the main courtyard. 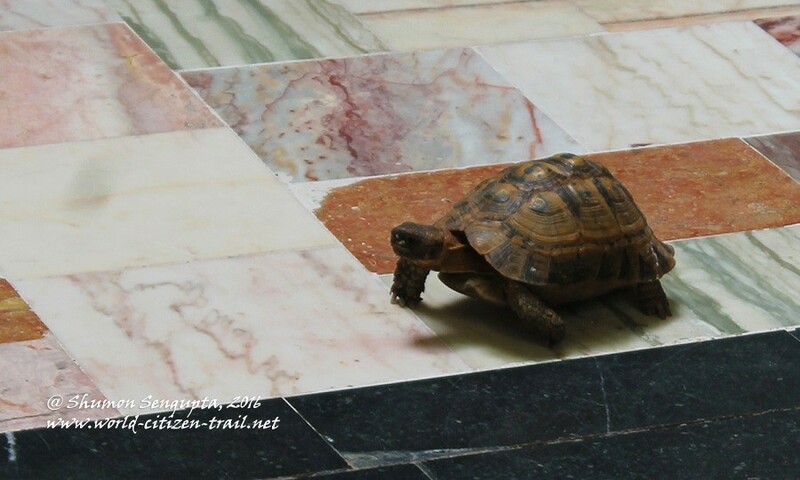 Here you will find a family of four small resident tortoises. 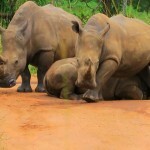 You can spend hours observing these delightful little creatures potter around the place, seemingly clueless and aimless. In the evenings, the courtyards are beautifully lit up with dangling wicker lampshades, arrays of glass lanterns mounted on the floor and on walls, and suspended jars with tea lights swaying to the evening breeze. 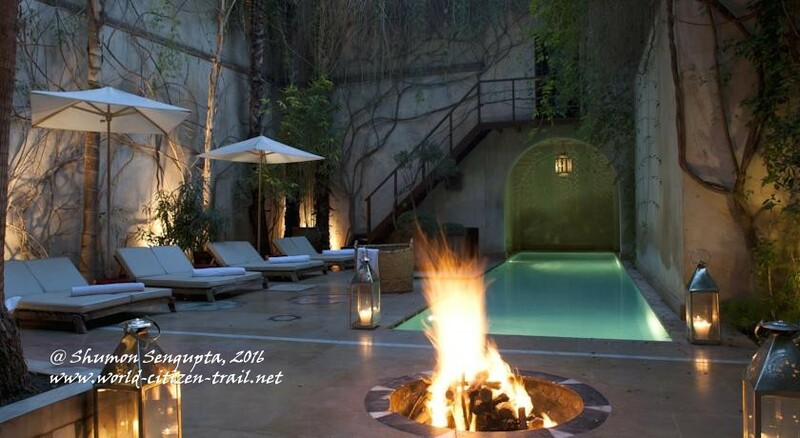 A bonfire by the main swimming pool in the second courtyard lends a surreal feel as sun sets and darkness descends. 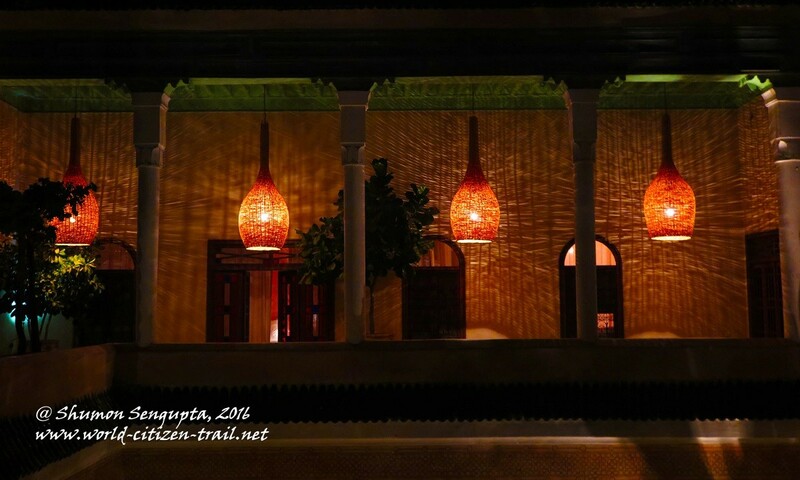 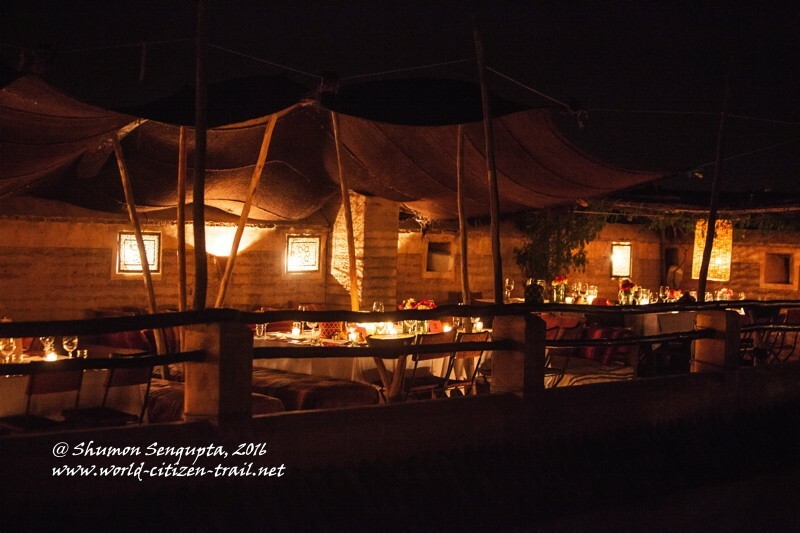 If the sundrenched days are translucent and dreamlike, lantern-lit evenings are starry and magical. 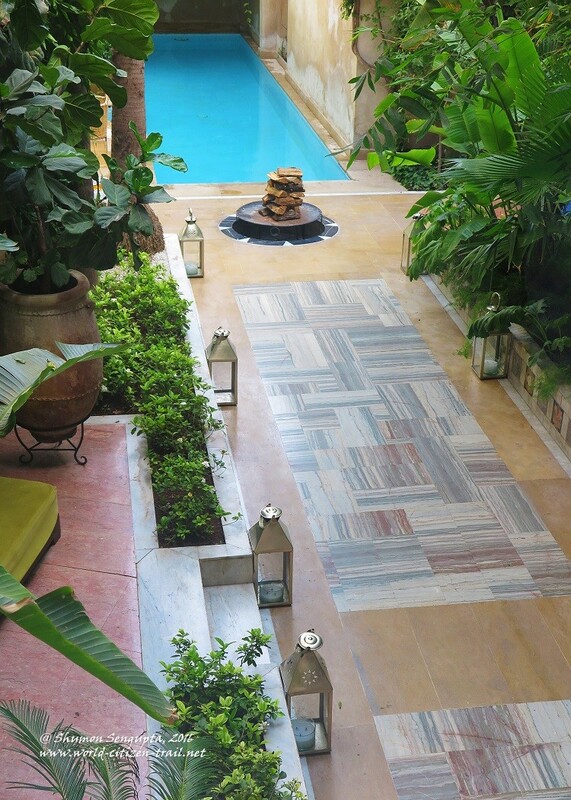 Surrounding the courtyards are numerous colonnaded enclosures, galleries and balconies that provide an equally alluring option to relax, unwind and soak in the atmosphere. These galleries and balconies have high ceilings and beautifully tiled floors, replete with rich Moroccan rugs, bright and colorful couches, day-beds, arm chairs and stools. 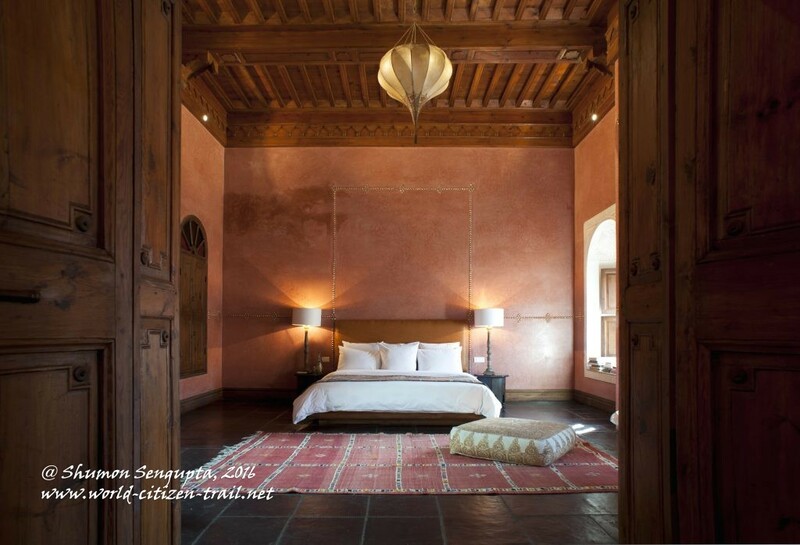 These wide galleries conjure a magnificent world of style, grandeur and serenity. 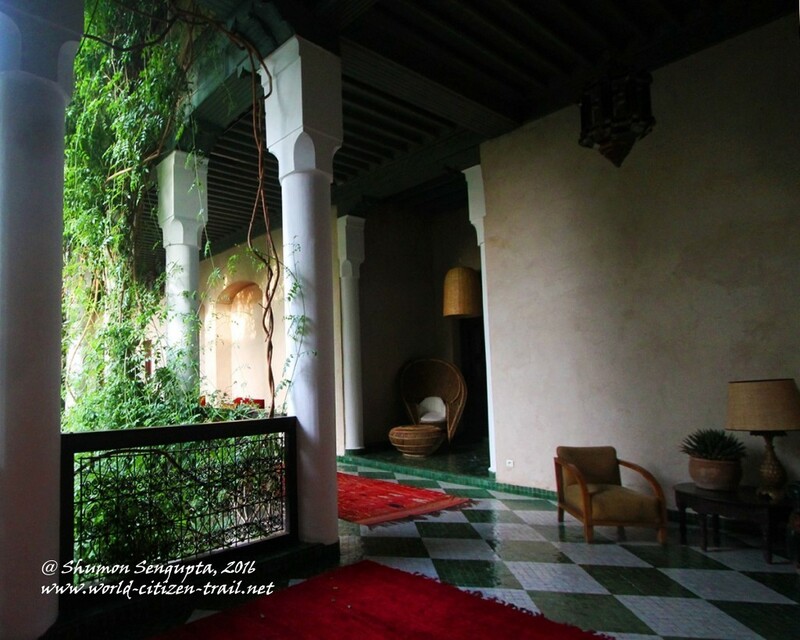 It takes you back in the mist of time. 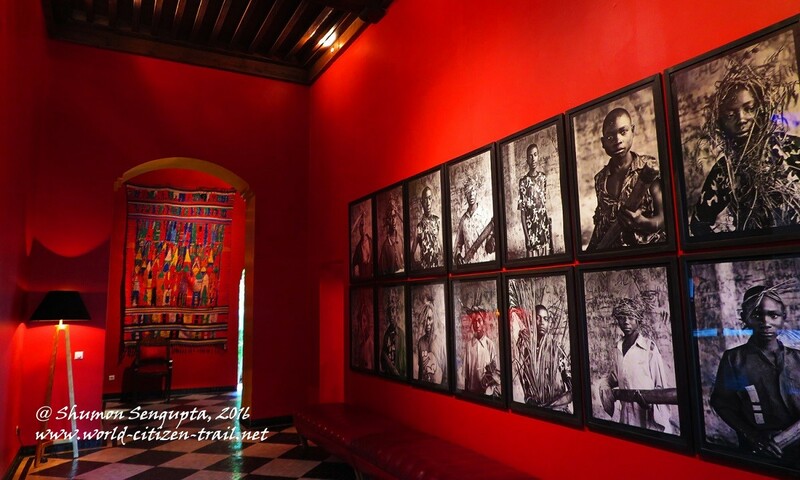 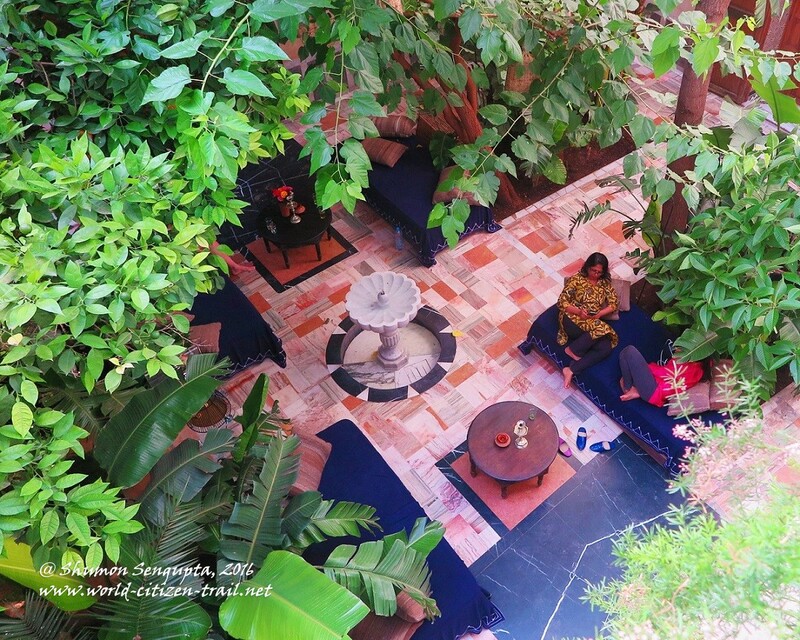 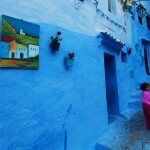 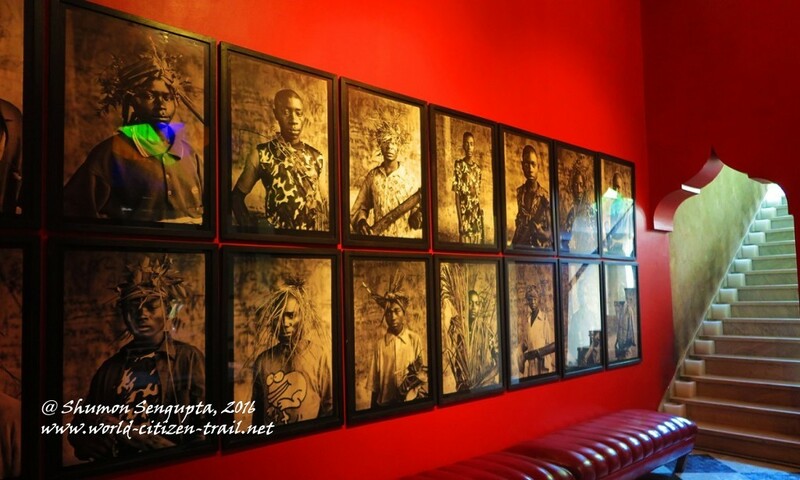 There is an impressive collection of outstanding art works on displayed in different parts of the Riad. 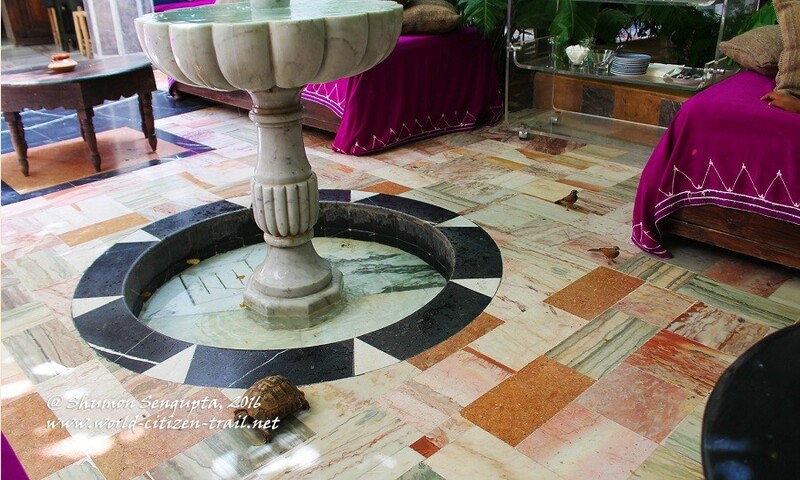 Immediately after you walk in through the entrance passage of the Riad you find a collection of colorful traditional footwear placed on the checkered marble floor. 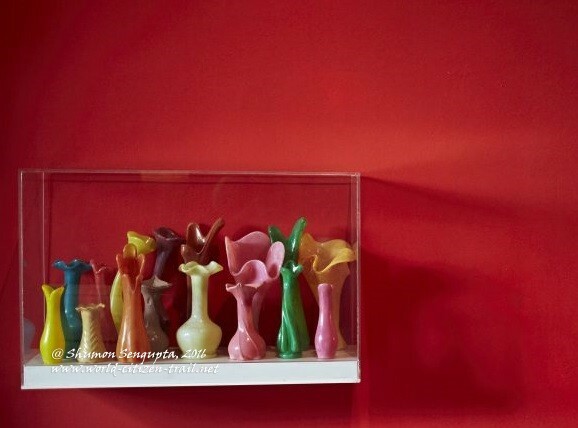 You will wonder if you are expected to take your shoes off, till you realize that the arrangement of footwear is actually a beautiful work of installation art. 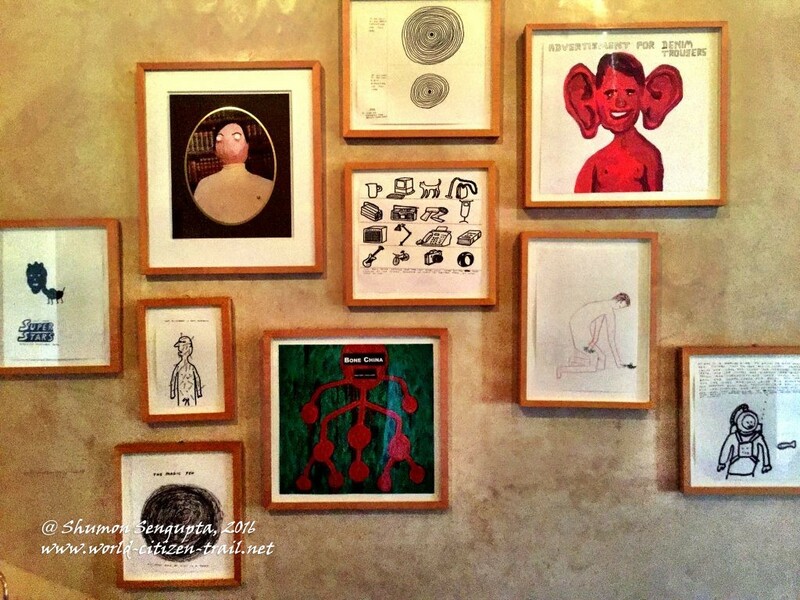 It feels as much as a prank as an art work. Along a long passage that leads to the second courtyard with the swimming pool, you have a haunting series of large black & white photographs of Congolese boy soldiers by Guy Tillim. 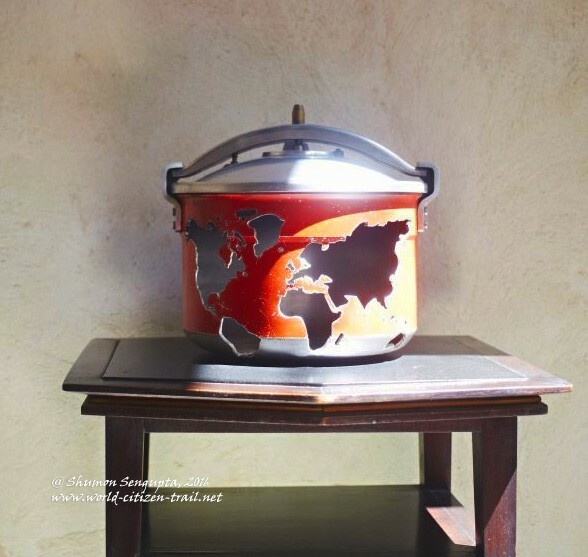 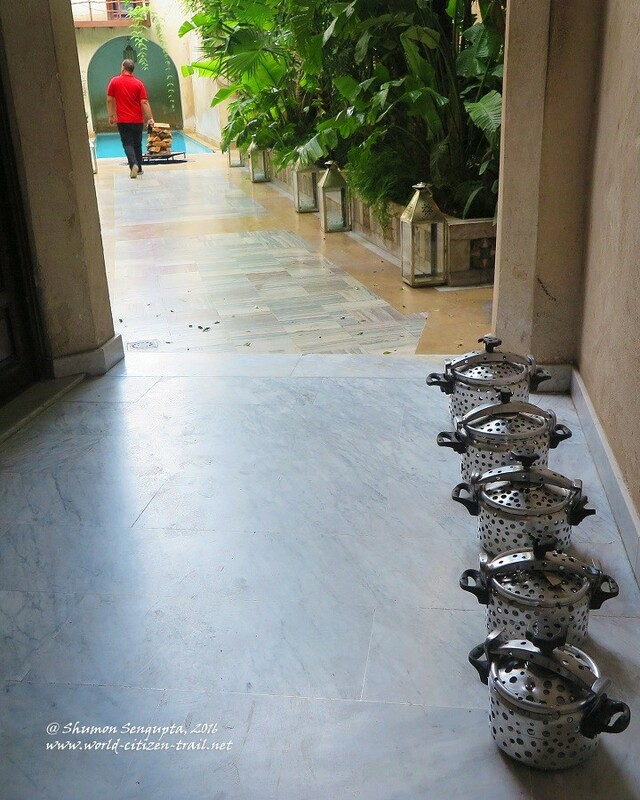 And below, on the floor to your right is an installation comprising a series pressure cookers with polka dots cut into the metal – a piece of conceptual art by artist, Batoul S’Himi. 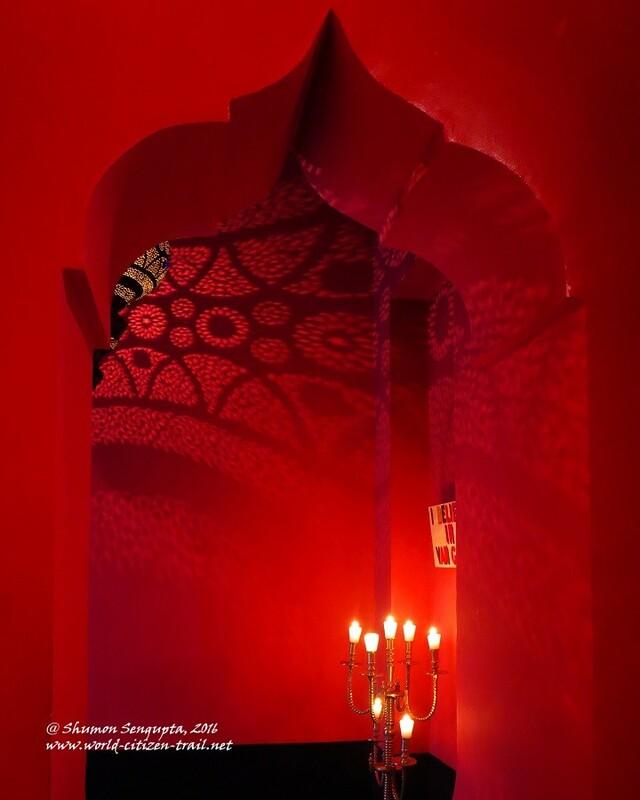 The adjoining restaurant has a brilliant art deco chandelier created by artist Francis Upritchard, and even boasts of a large work by the legendary Bridget Riley. 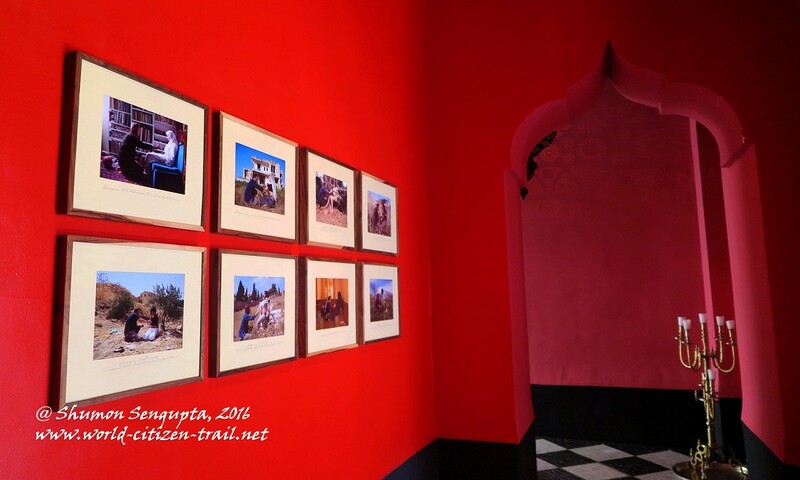 Ink studies by Sir Antony Gormley, works by William Kentridge, a collection of fascinating photographs of Morocco of the 1960s (taken by Terence Donovan), and clusters of beautiful watercolor and acrylic paintings are mounted in different places. 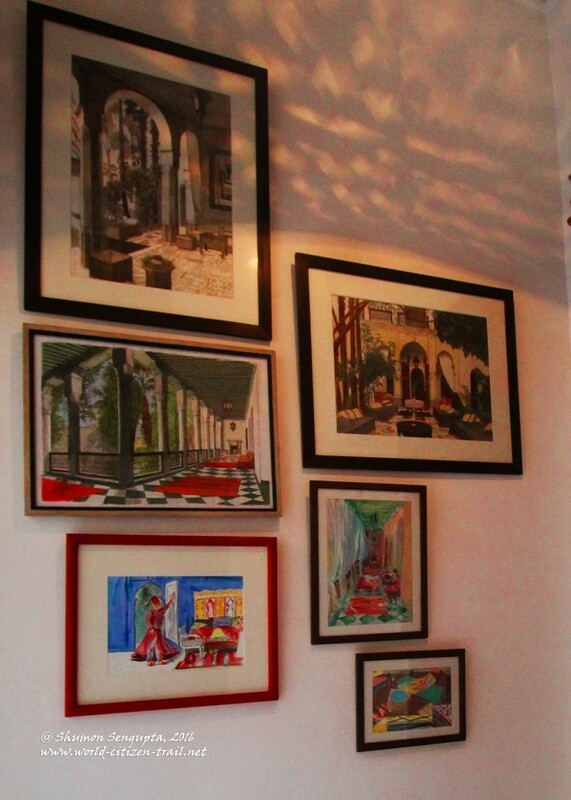 These works of modern art compete with contemporary installations and antique Moroccan rugs hung from the high walls. 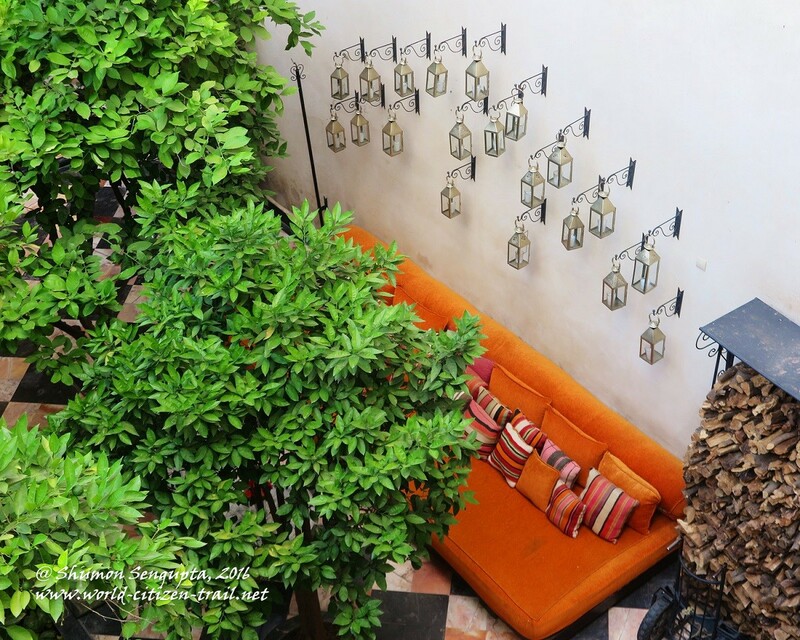 The place breathes art; the collection is highly eclectic, at the same time bearing an underlying sense of refinement, authenticity and harmony. The Riad has 25+ beautiful, uniquely designed rooms, each with a unique color scheme and decor. 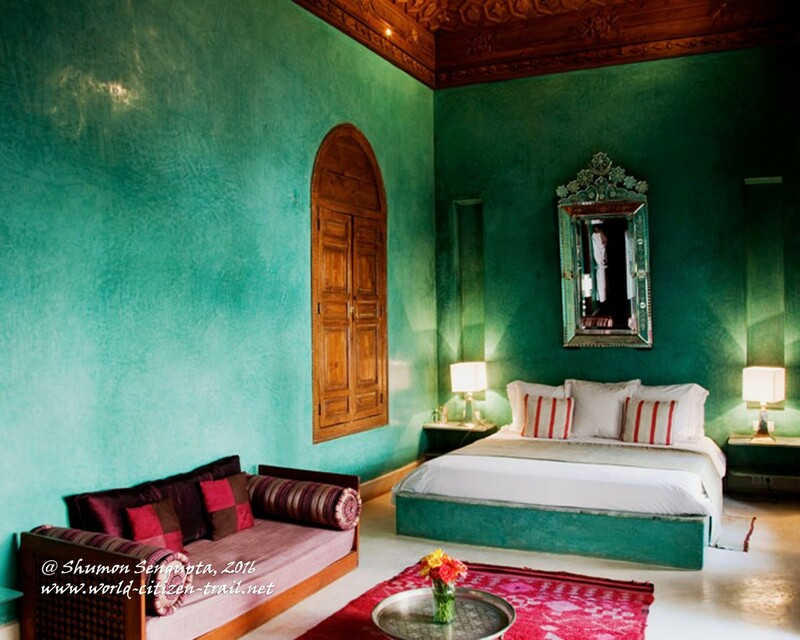 Most of the rooms have lofty ceilings and massive beds. 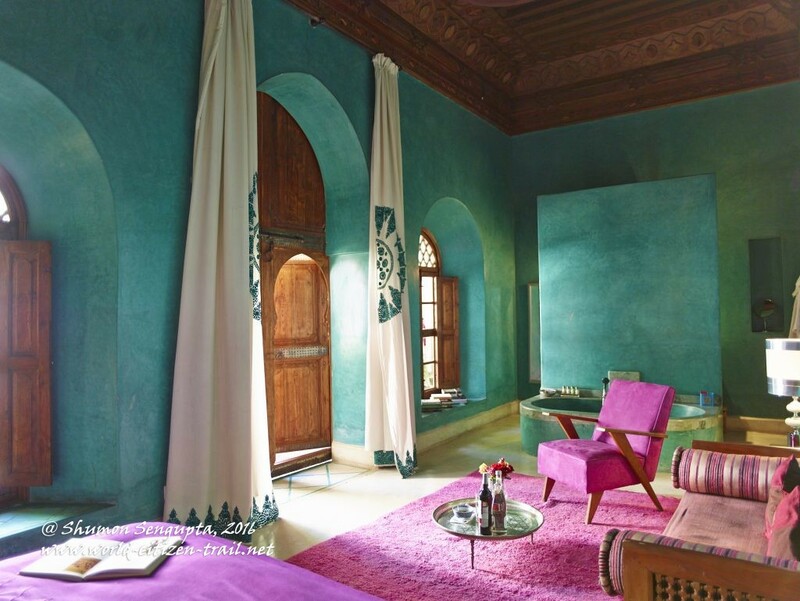 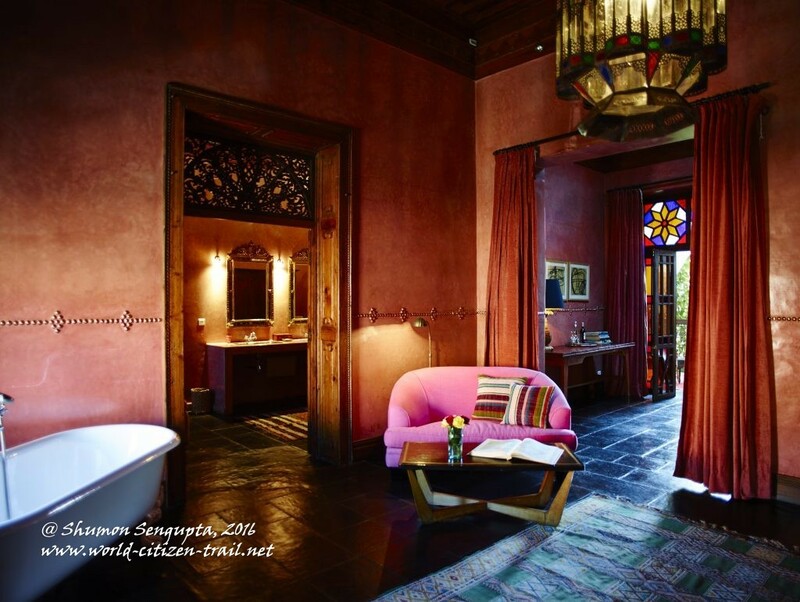 Walls and baths are done in brilliant colors using ‘tadelakt’, the traditional Moroccan polished lime plaster technique. 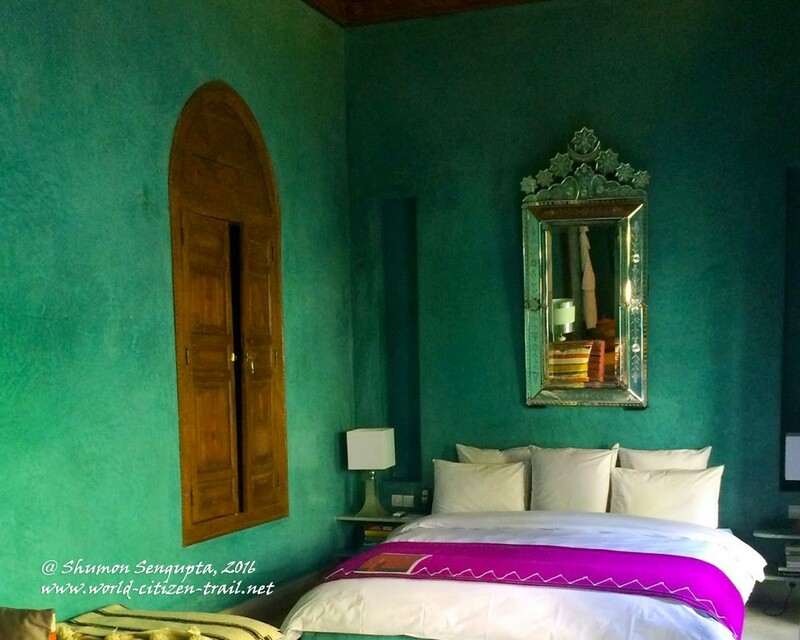 We did not find the use of any synthetic fabric; it was mostly Egyptian cotton and wool – colorful and richly textured, with a vibrant, earthy feel. 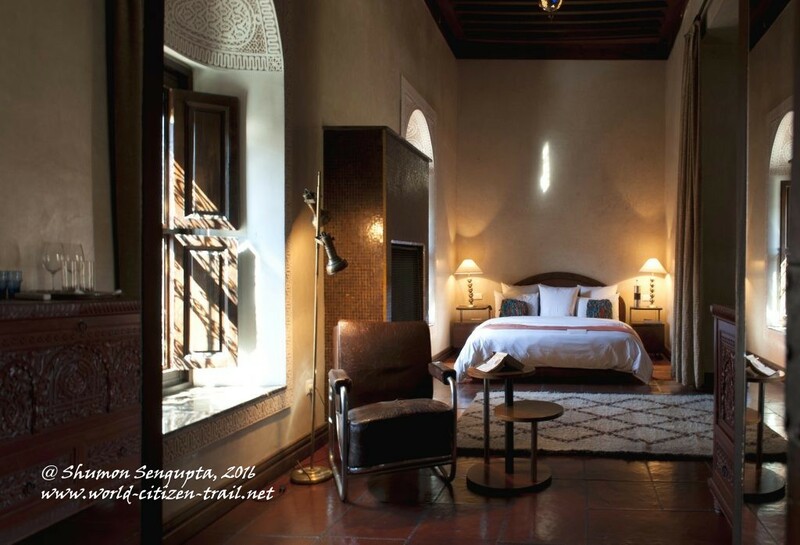 I have included photographs of some of the bedrooms, downloaded from the official website of El Fenn. 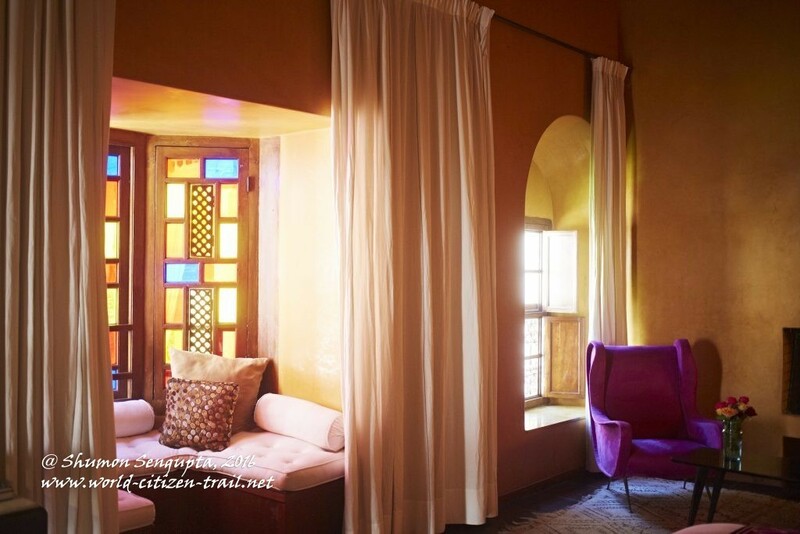 We were traveling as a family and I had booked one of the extra-large suites. 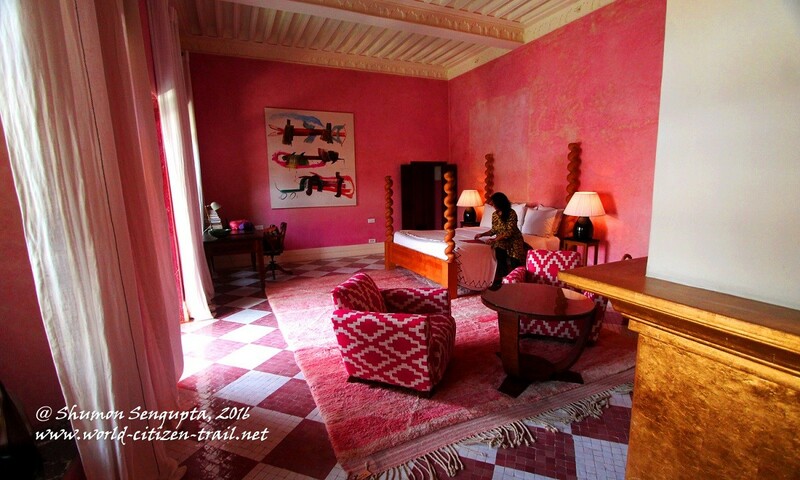 As it turned out, they had allotted the ‘Pink Room’ to us, apparently the largest in this category. 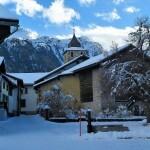 “Wow! 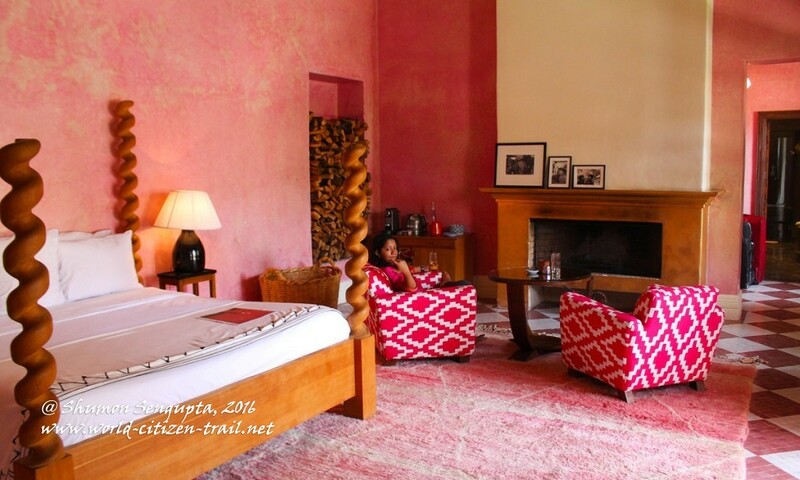 I love this room; the best hotel room ever, Babi!” promptly declared Minnie. 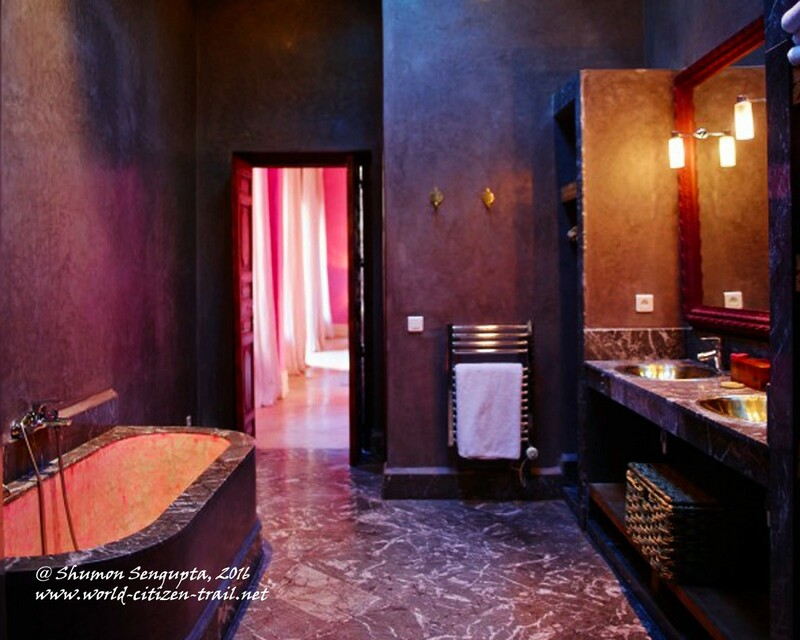 I hesitated and then hastily concurred. 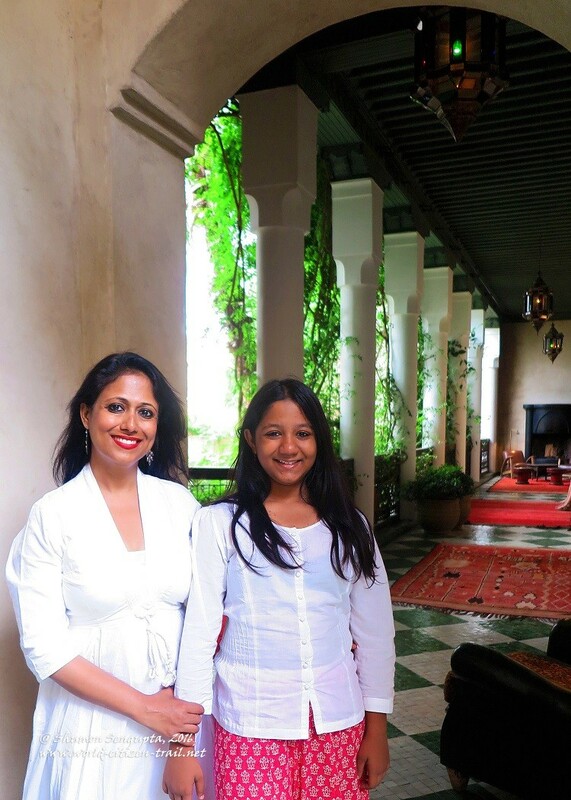 Now you don’t argue with your 11-year old daughter on such matters, do you? 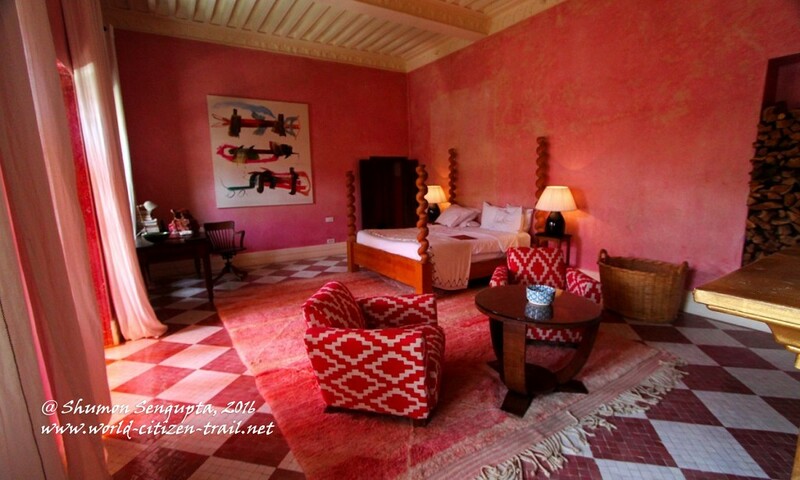 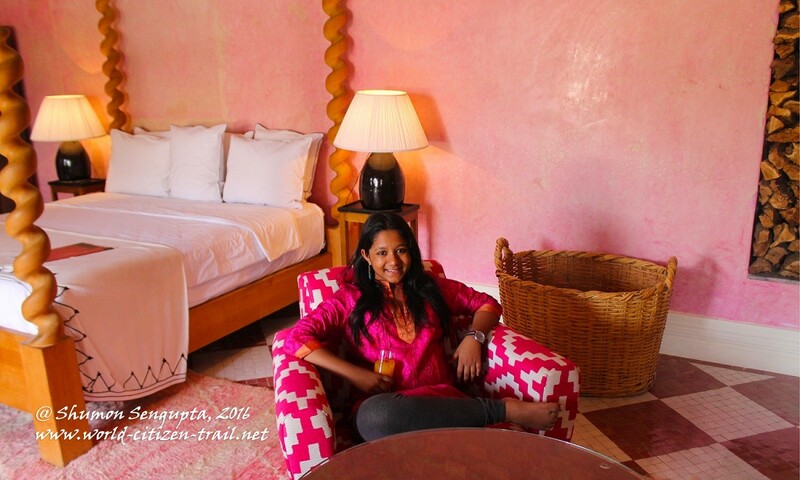 I did like the burnt pink color no doubt, but I was not sure of a room drenched in it. Needless to say our room was sprawling and very comfortable, with and amazing bathroom. 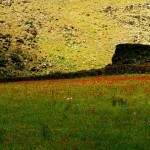 On second thought, I thought it was actually beautiful. And it had an awesome terrace with large dangling wicker lampshades that looked incredibly surreal in the evenings. Rooms in El Fenn don’t have telephones of television; you shouldn’t need these at this place. 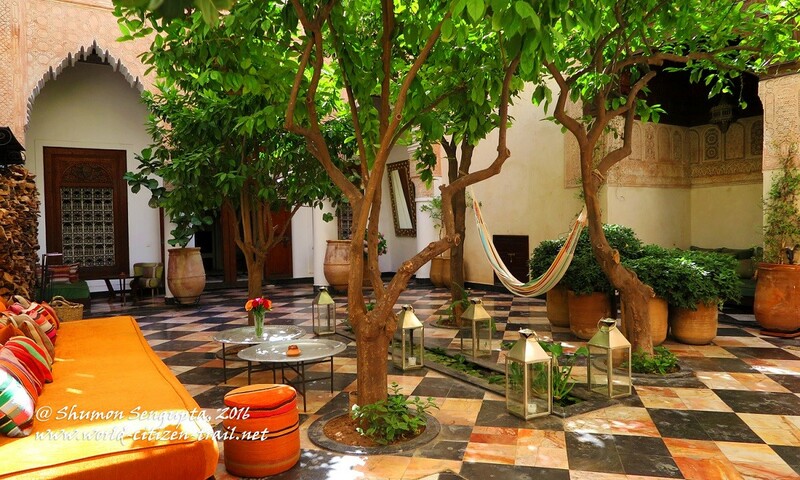 And there are no room keys, the place is safe and secure. 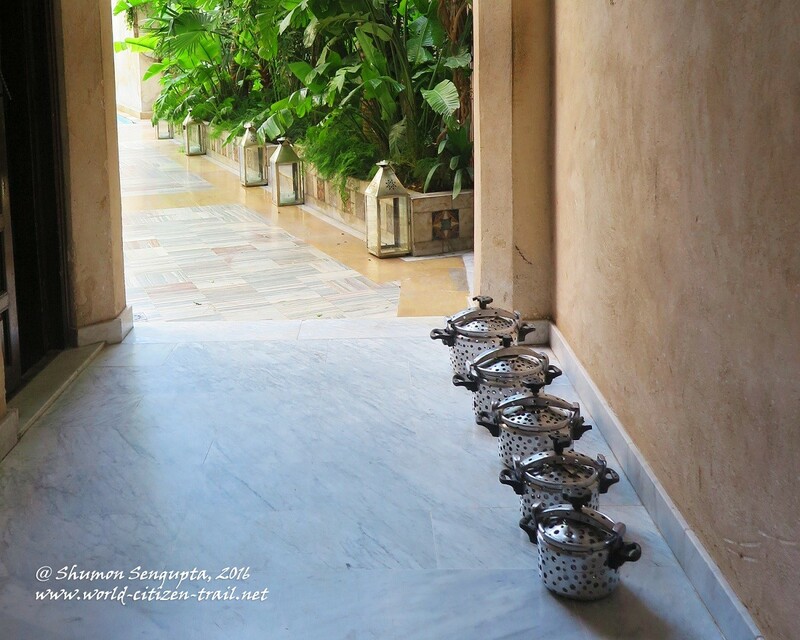 Tea/coffee is left outside the room in a private sitting area, early in the morning. 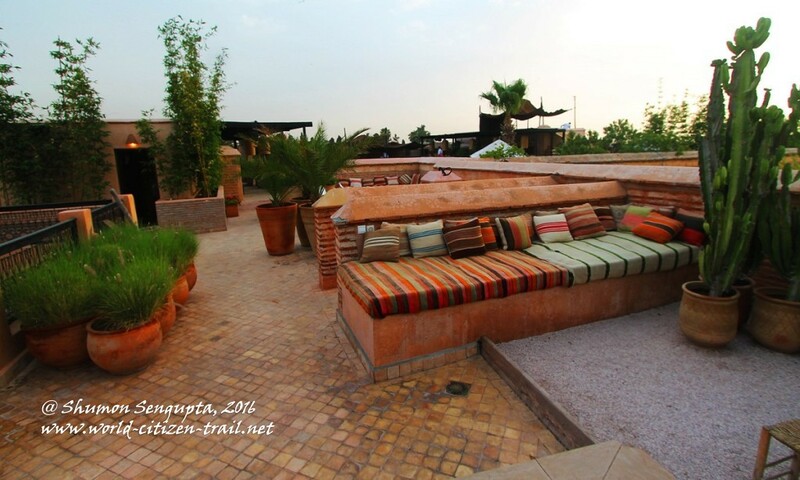 There is a splendid rooftop terrace on top of the third floor, overlooking the city. 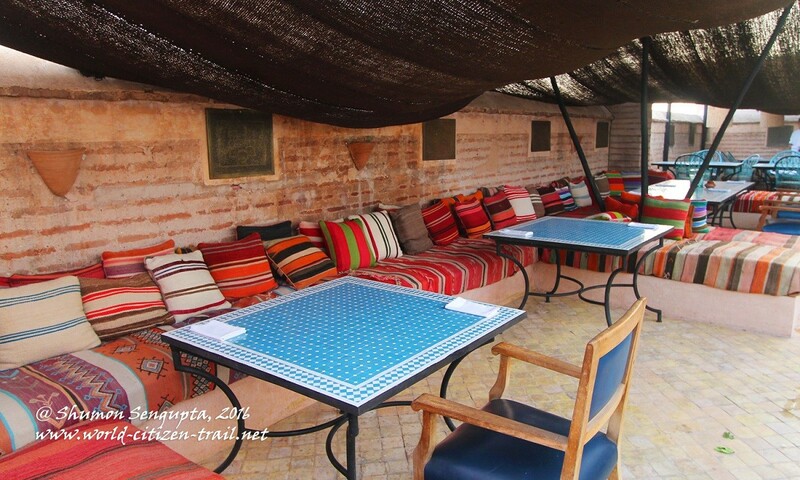 Parts of the terrace are shaded by traditional Berber tent cloth. 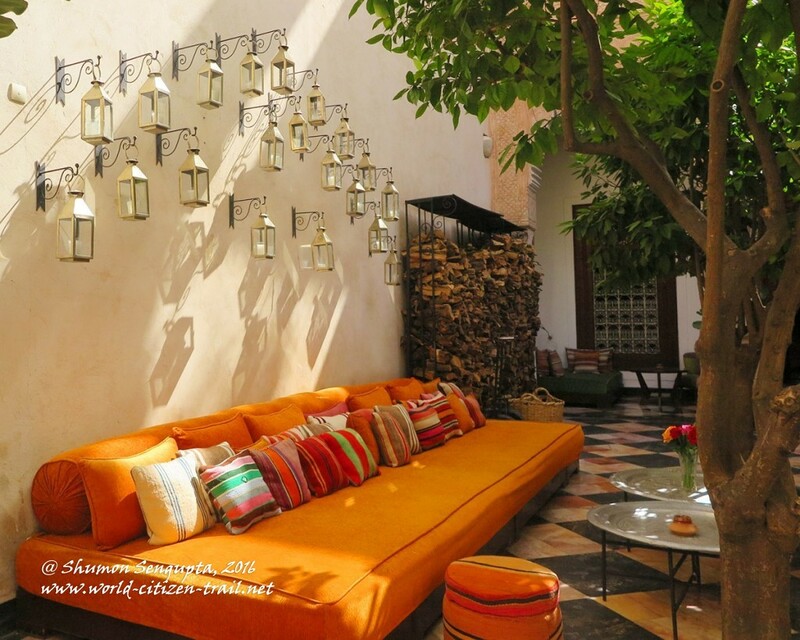 With its sprawl of comfortable multi colored couches, daybeds and cushions, this is yet another place where you can spend your mornings and evenings. 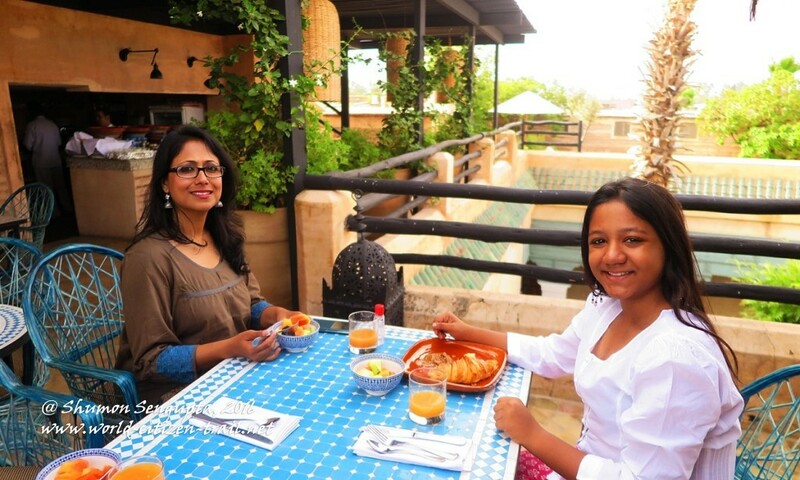 Breakfast is served at the terrace and you can also order your lunch and dinner here, the latter enjoyed under the stars on a clear night. Food served at El Fenn is simple, fresh and delicious, made from fresh seasonal local produce, much of it is said to be organically grown in a farm in the foothills of Atlas Mountains. From this terrace you get some excellent views of the ancient labyrinthine Medina and the Koutoubia Mosque. 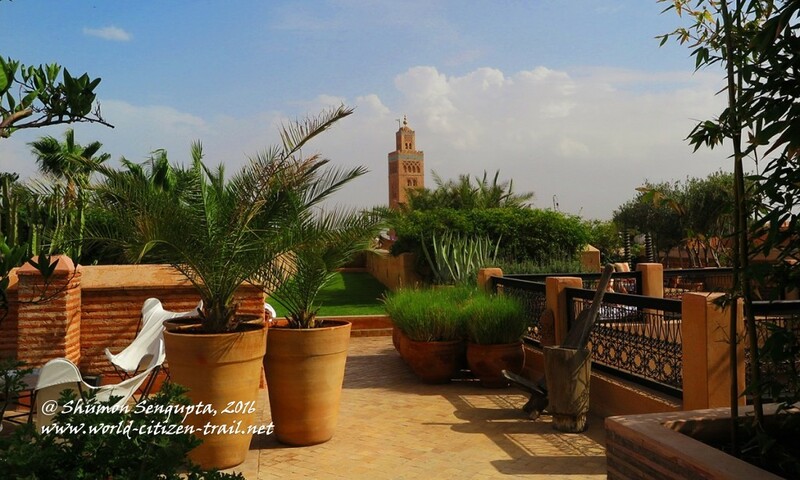 On a clear day, the distant snowclad Atlas Mountains are visible. 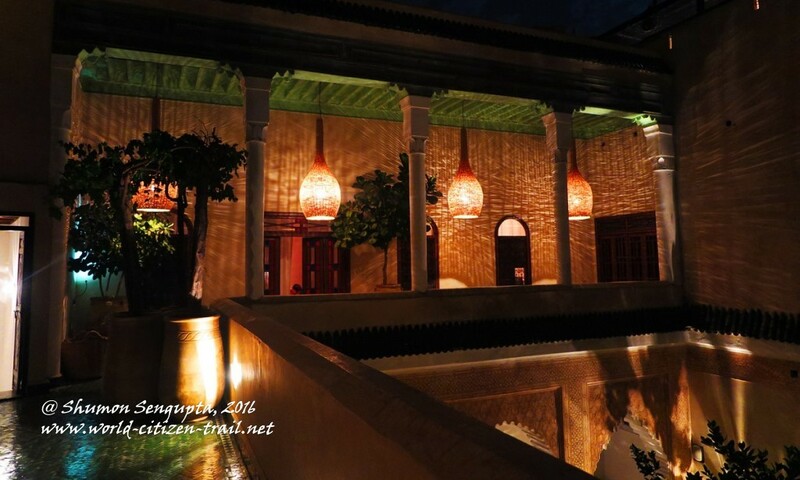 In the evenings the muezzin’s call of prayer feels intensely spiritual and you are transported into a tranquil, unfathomable world of mystery and wonder. 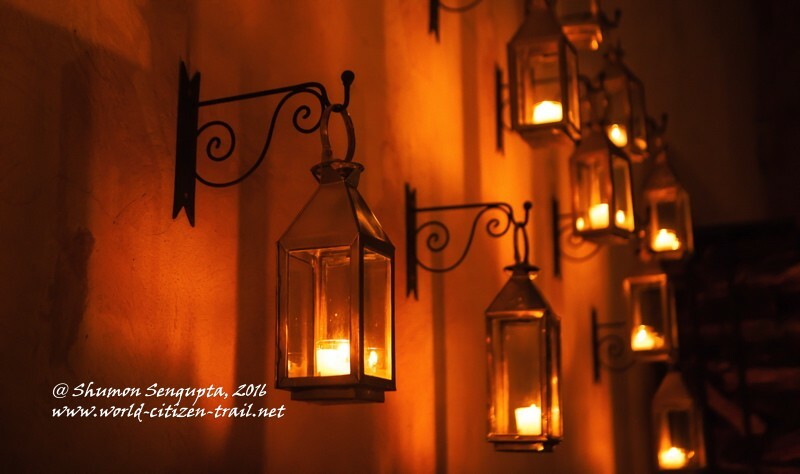 At dusk, the city gradually lights up, and as darkness descends, it is enveloped in a magical glow. 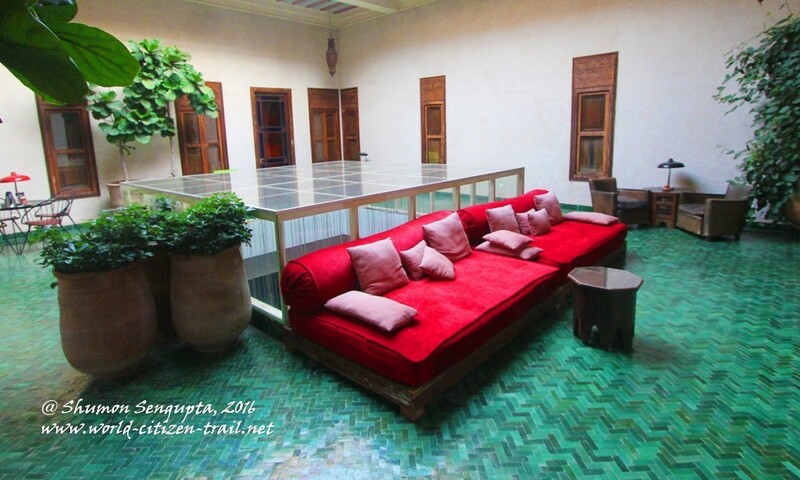 Photo Source: El Fenn Official Website. 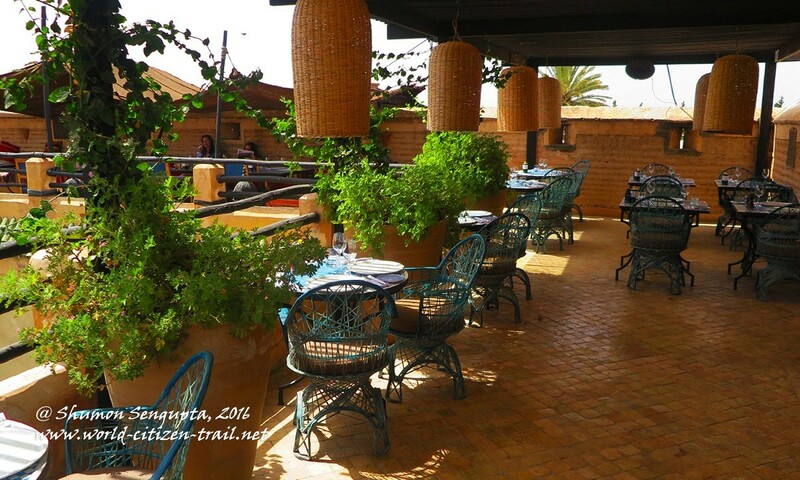 Service at El Fenn is of a very high order and comes with a personalized touch. 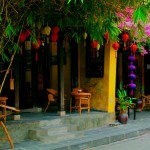 Staff are polite and discrete, at the same time charming and helpful. 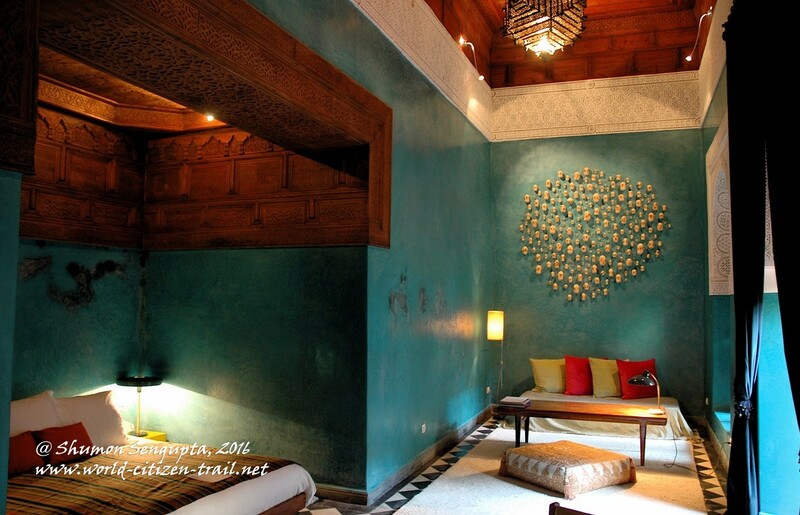 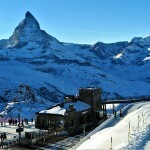 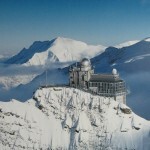 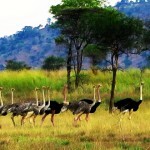 There is none of that stuffy, snobbish air that you would generally associate with such exclusive upmarket hotels. El Fenn is a casual, relaxed, authentic and totally easy going place. 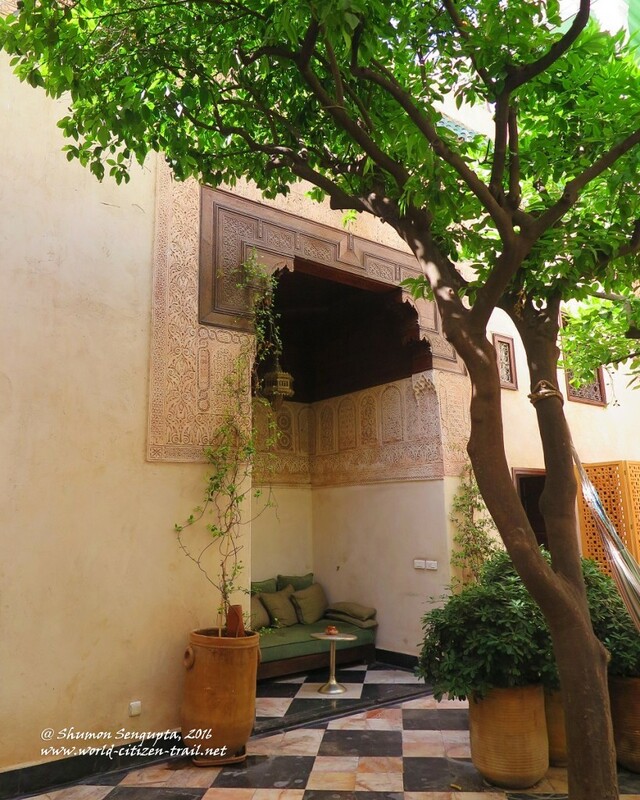 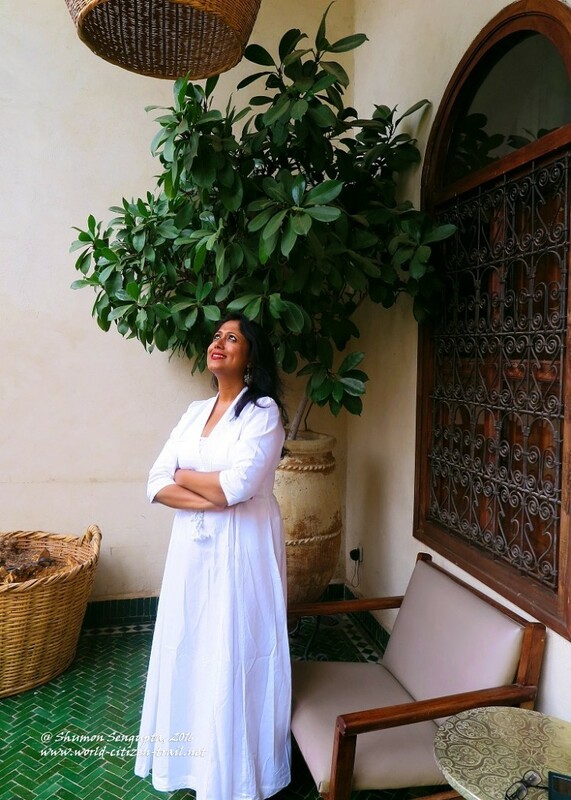 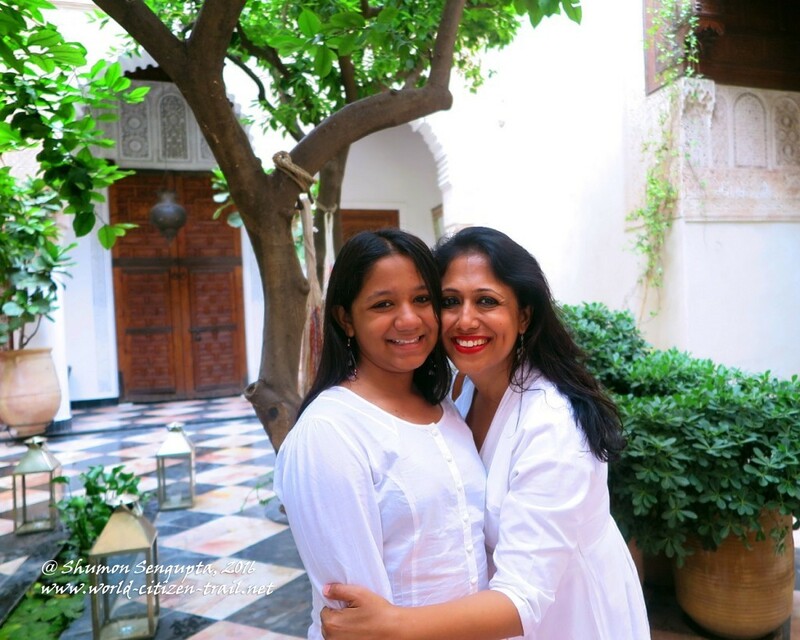 Although the Riad is located in the Medina, amidst the hustle and bustle, once the main entrance door is closed behind you, you are engulfed in silence. 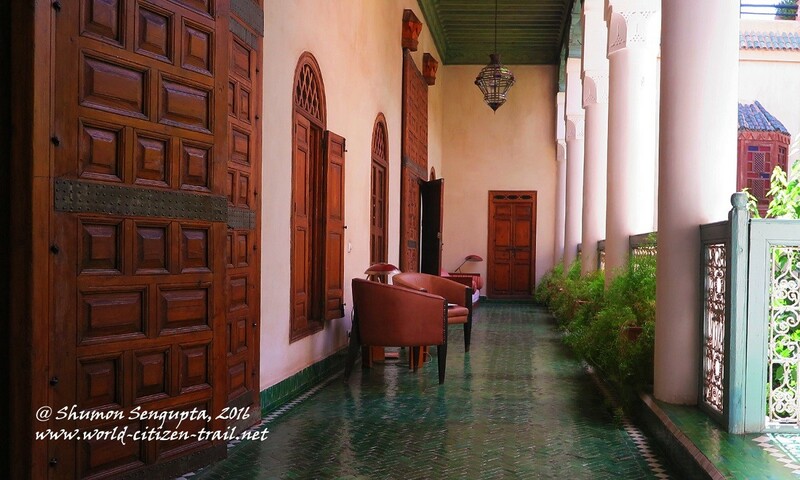 Heavy fortified walls, over a meter thick, ensure that the sounds of the Medina are shut out, providing total seclusion and serenity. 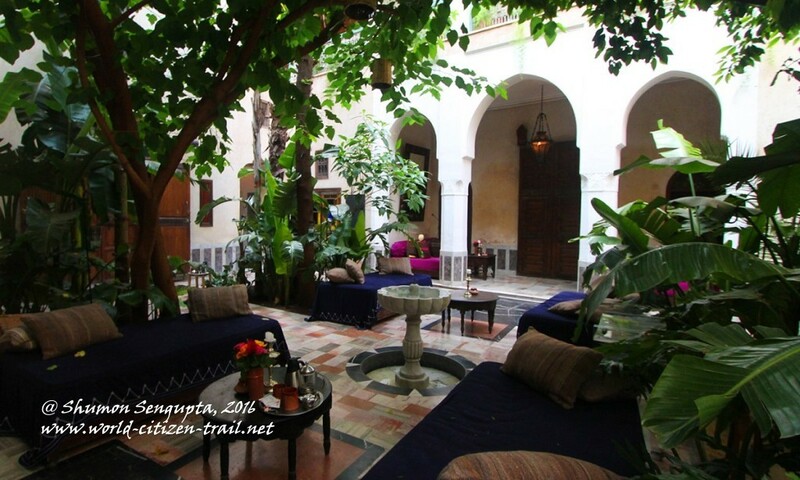 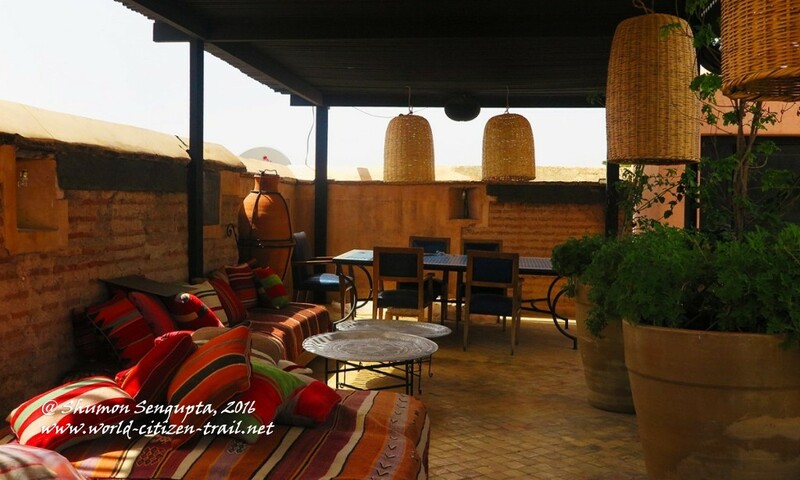 El Fenn is a great place to explore the old part of Marrakech from. 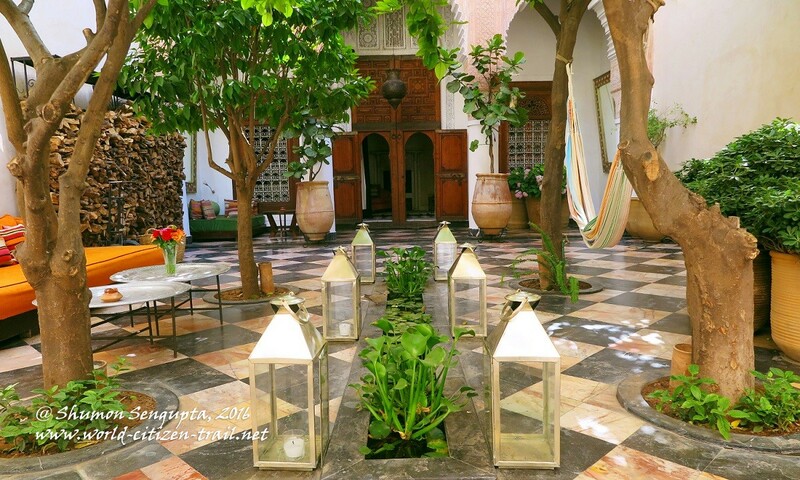 The important sites within the ancient Medina including the iconic Djema el Fna square, the labyrinthine souks, the exquisite Ben Youssef Madrasa, the ancient Jewish quarters, the museum of photography are all within walking distance. 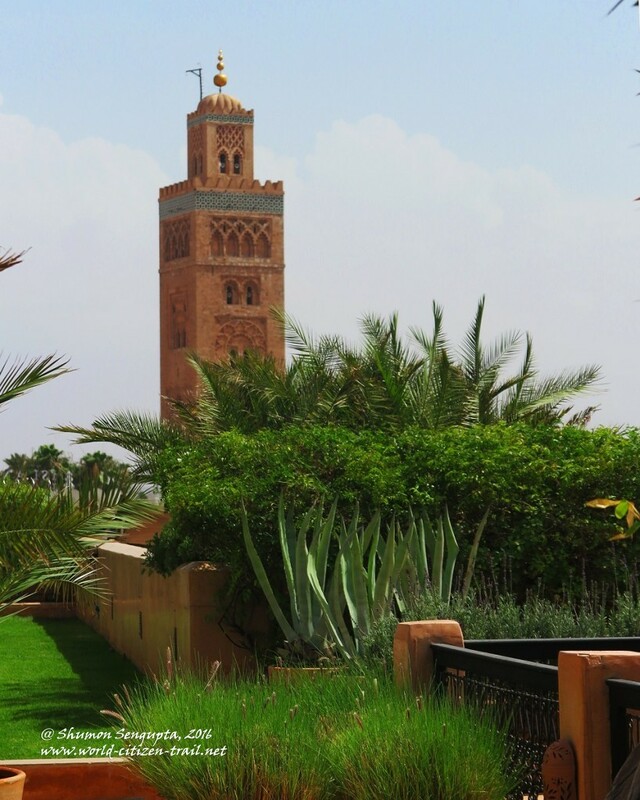 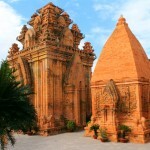 The imposing Koutoubia Mosque, which is open only to Muslims, may be admired from a distance. 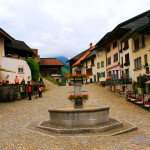 El Fenn is a place of unsurpassed beauty, character and a textured old world charm. 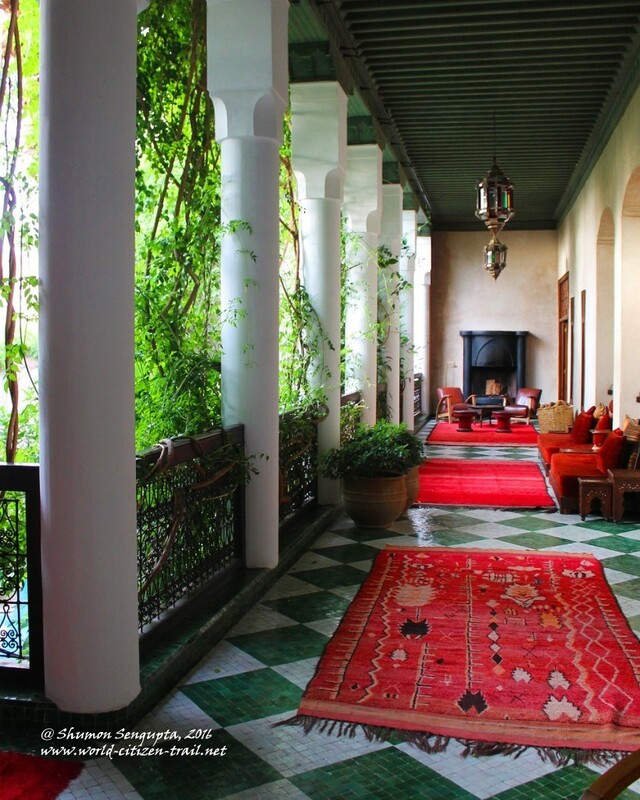 It bears the mark of a unique aesthetic sensibility that is at once bohemian and refined. 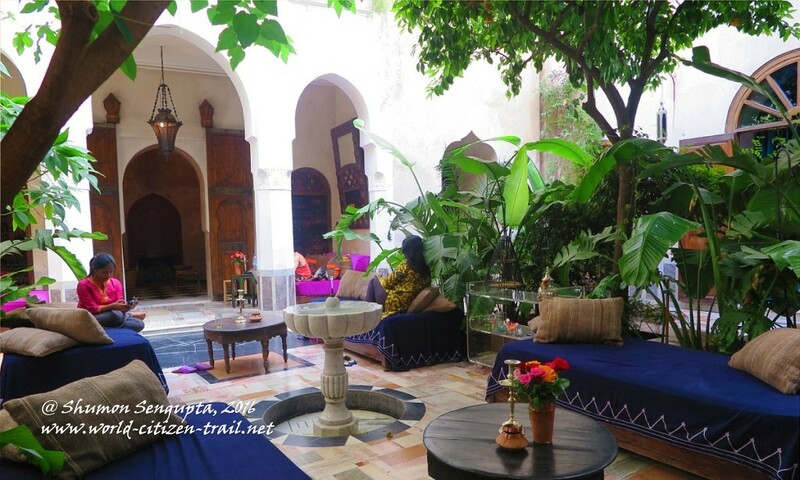 It emanates an aura of mystery and romance that is so quintessential of the city of Marrakech, of the exotic mystique of Morocco. 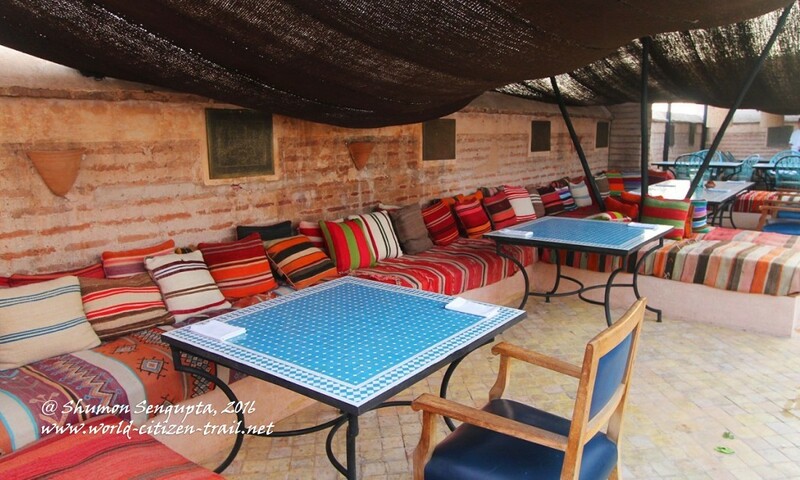 Suffice to say, El Fenn it is a destination in itself.